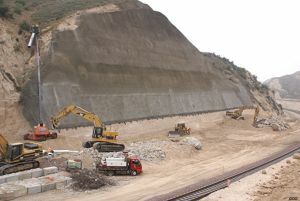 Photo 598: JAWS, the "PECKERHEAD", and the CLAW breakup the North wall of T-1. 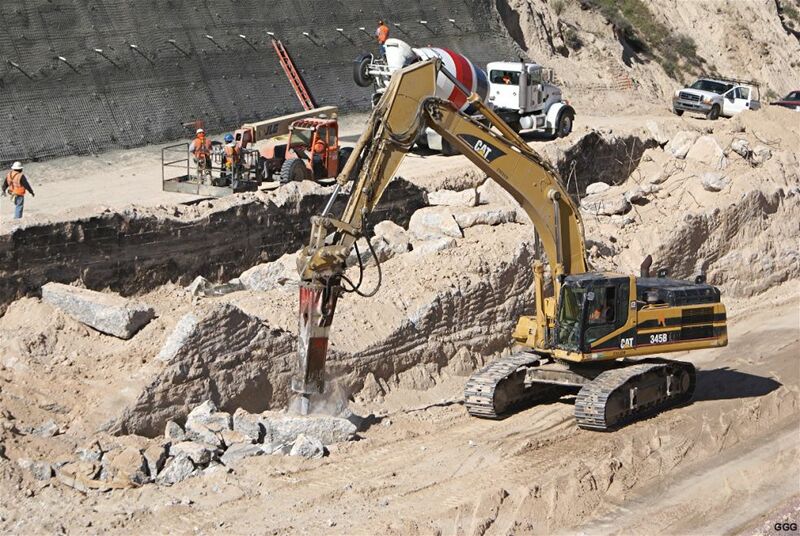 "Peckerhead" is a construction guy term for the HAMMER DRILL. 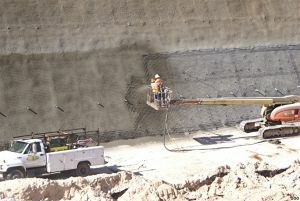 Photo 599: shows the work of the trio mentioned above and DrillTech doing their thing on "the shotcrete wall". 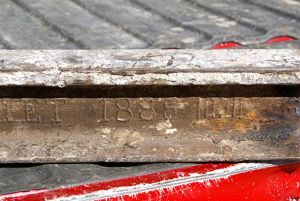 Photo 600: shows the thickness of the 1913 concrete walls ---- no match for the AMES construction experts and their equipment. 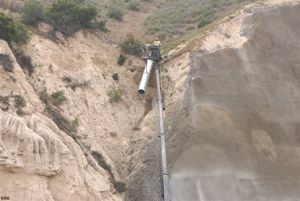 Photo 601: DrillTech doing their ShotCrete spraying thing on "the wall". Someone told one of us that these are the tallest shotcrete walls in the WORLD ??? 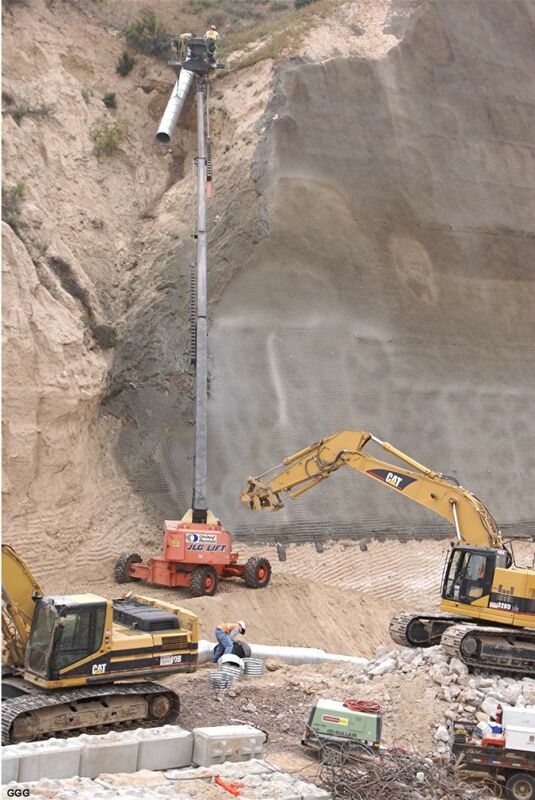 Photos 602 - 604: The Hammer Drill/Peckerhead doing its thing on HUGE concrete blocks. 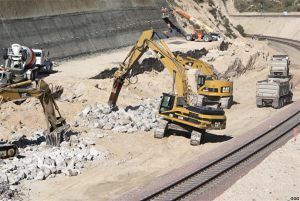 Photo 605: Last Friday, 5/09/08, Ames was completing dirt removal from the T-1 area. 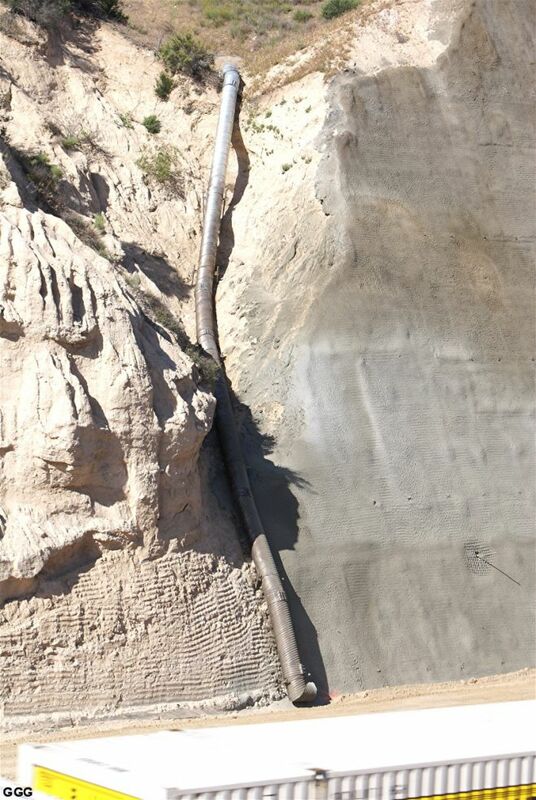 It appears that Drill Tech can complete the ShotCrete wall with one more application. 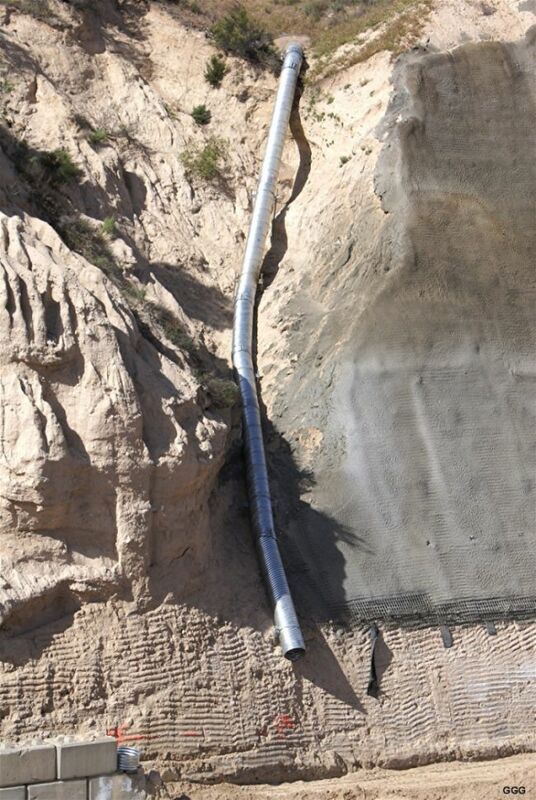 Photos 606 - 607: Ames was also installing a large drainage pipe to protect the East end of the ShotCrete wall in the old T-1 area. 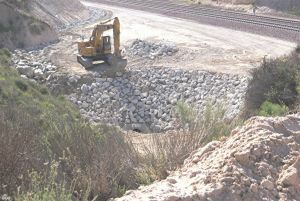 Photo 608: Marc sends a photograph of the refilling of the old borrow pit near BNSF MP 62.5. 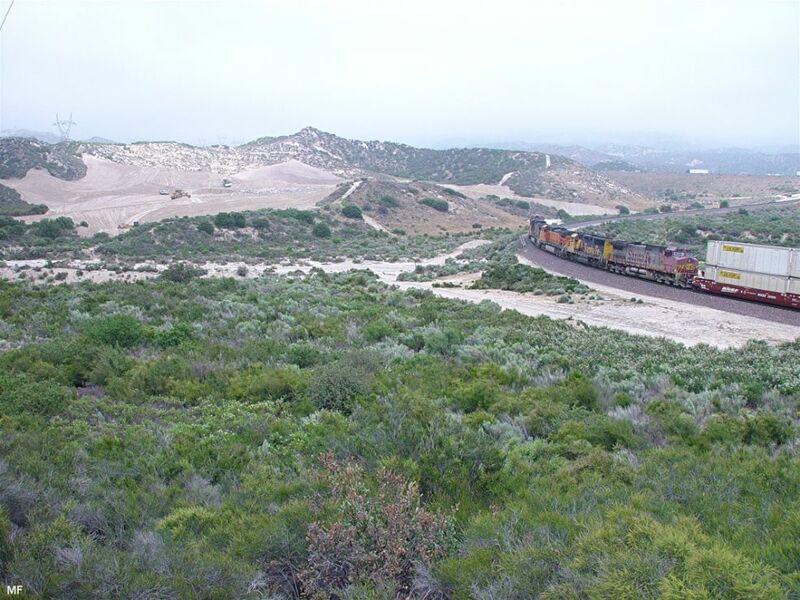 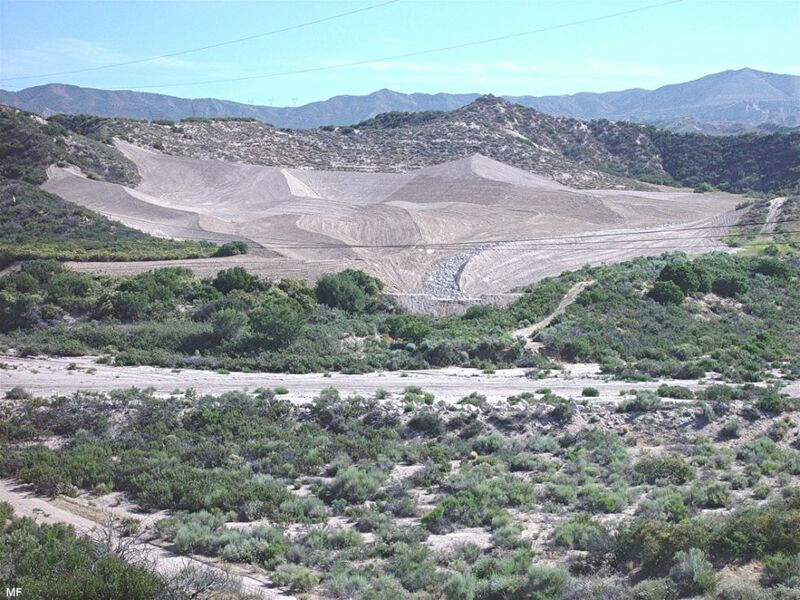 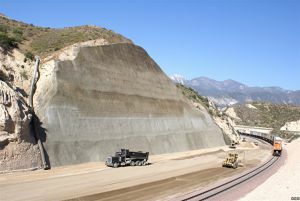 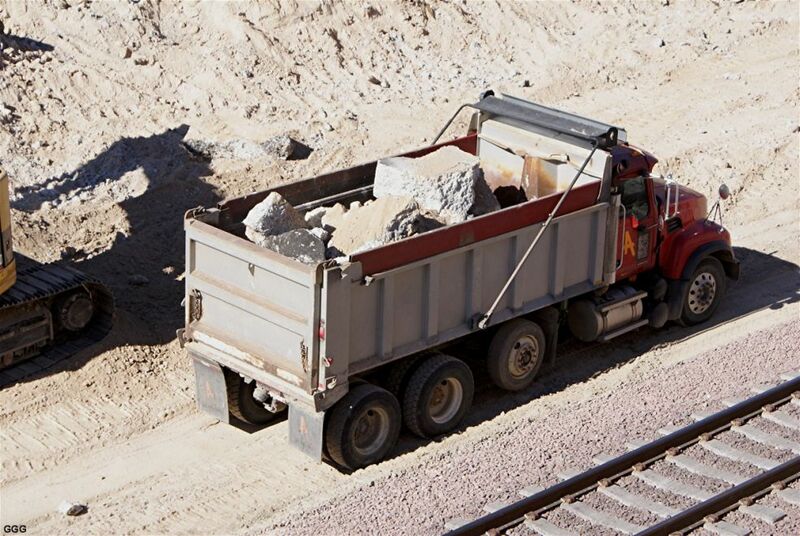 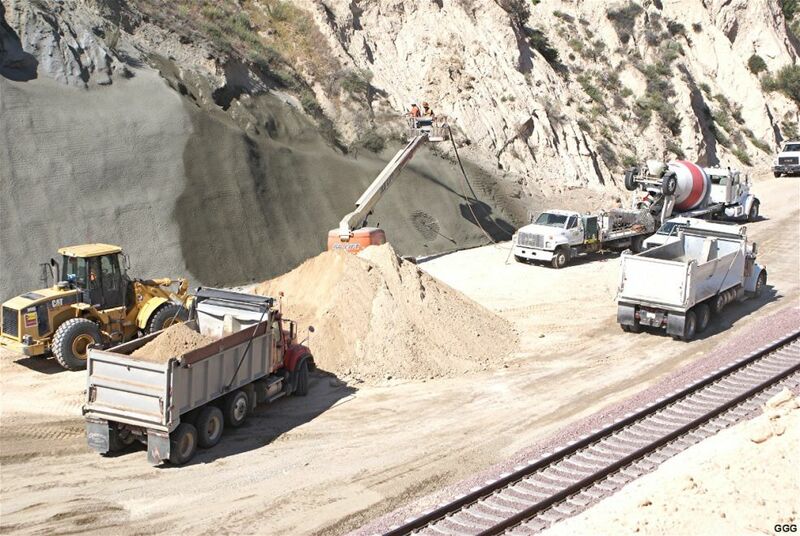 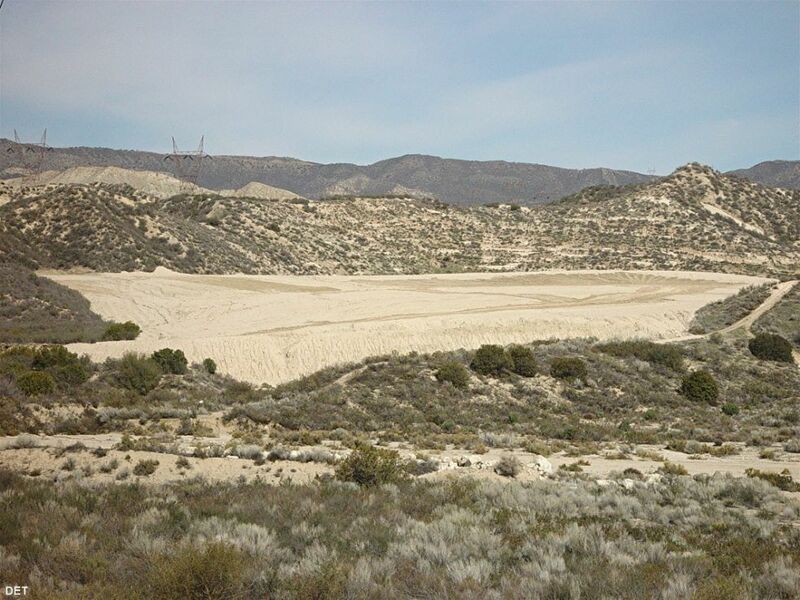 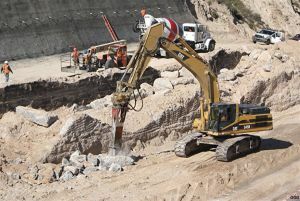 Dirt from the pit was used to build Interstate 15 years ago, leaving a very large hole. 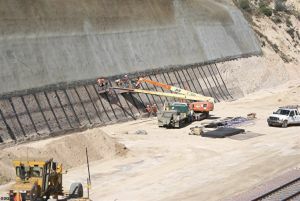 Ames refilled the pit with the excess dirt from the Tunnels and, in the photograph, is grooming the area to the original contours. 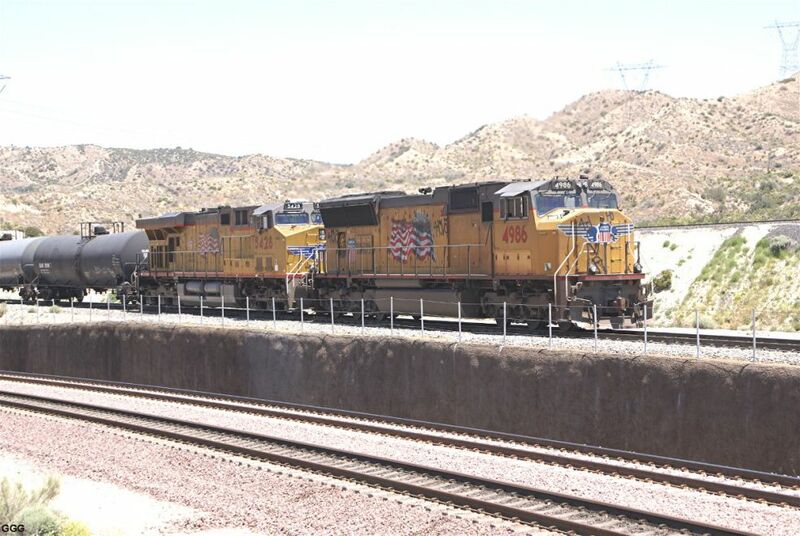 Photos 609 - 614: On 5/05/08, BNSF completed installation of the last two very long and very heavy high speed switches at CP Walker. 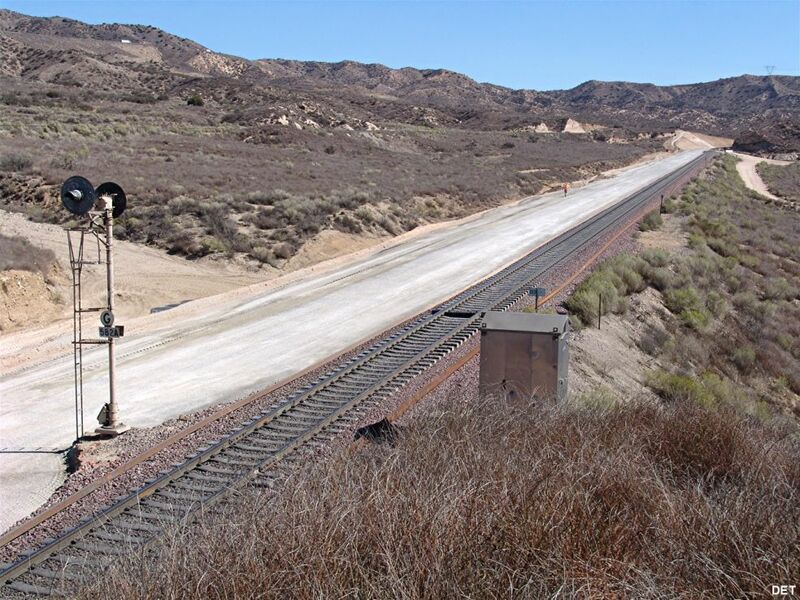 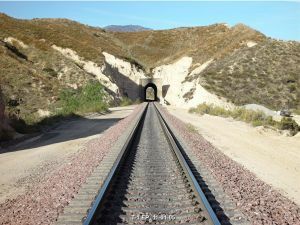 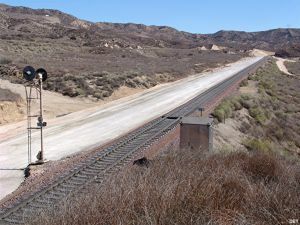 CP Walker is just RR West of Interstate 15 at BNSF MP 60.2X. 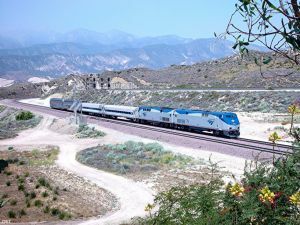 (Don Toles and Marc Fournier photographs). 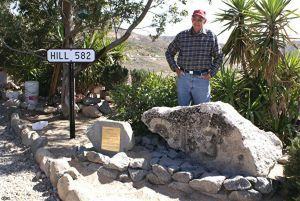 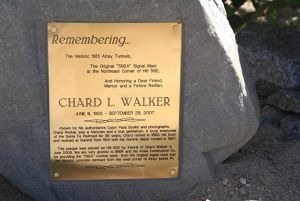 Photos 622 - 625: Don Toles led the effort to place a plaque on Hill 582 honoring our friend Chard Walker and, also, to remember the BNSF Cajon Tunnels. 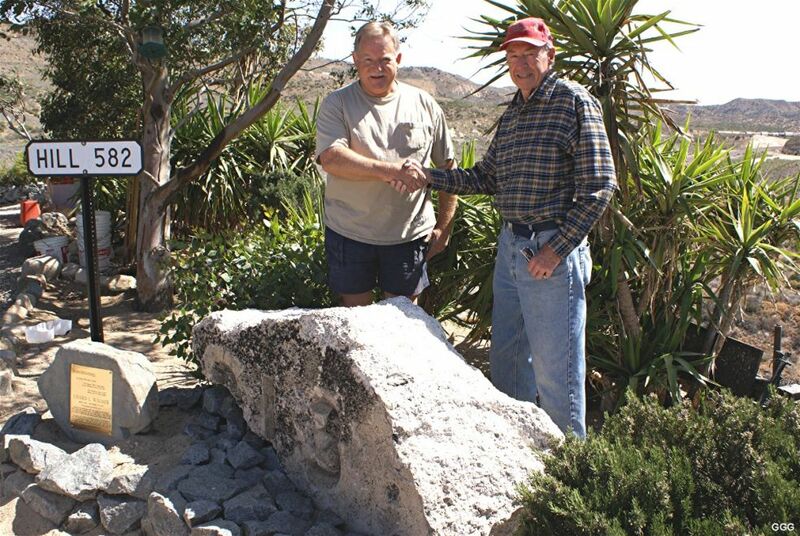 The stone and plaque were placed today (5/14/08), next to our piece of Tunnel 1 West Portal (the "1913") --- with the help of Jerry Shinar and Marc Fournier. 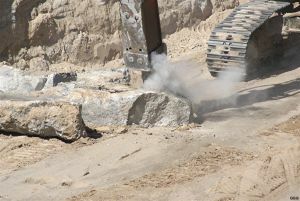 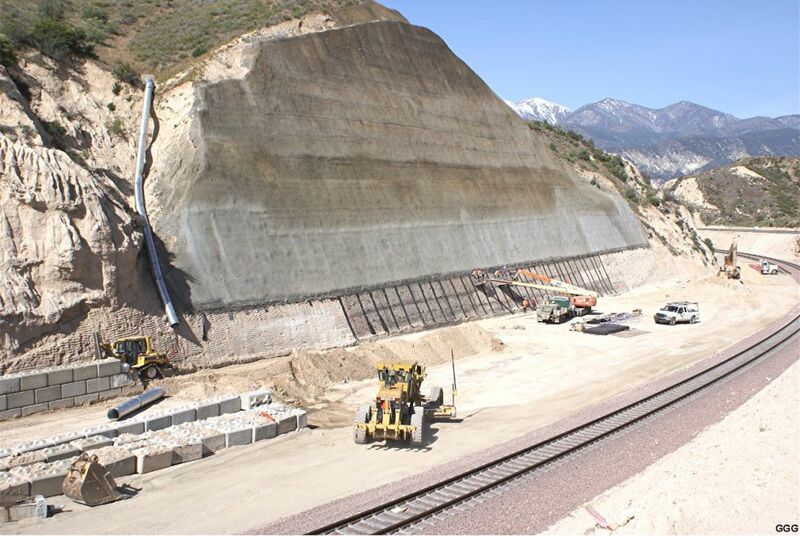 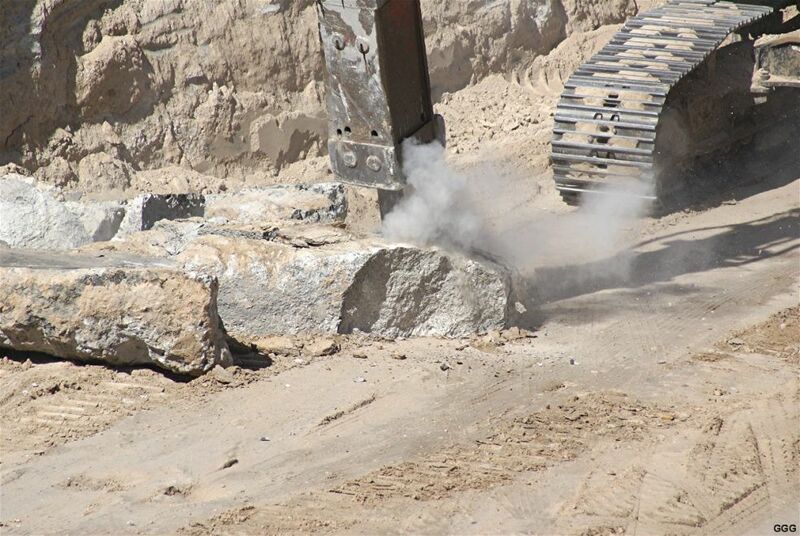 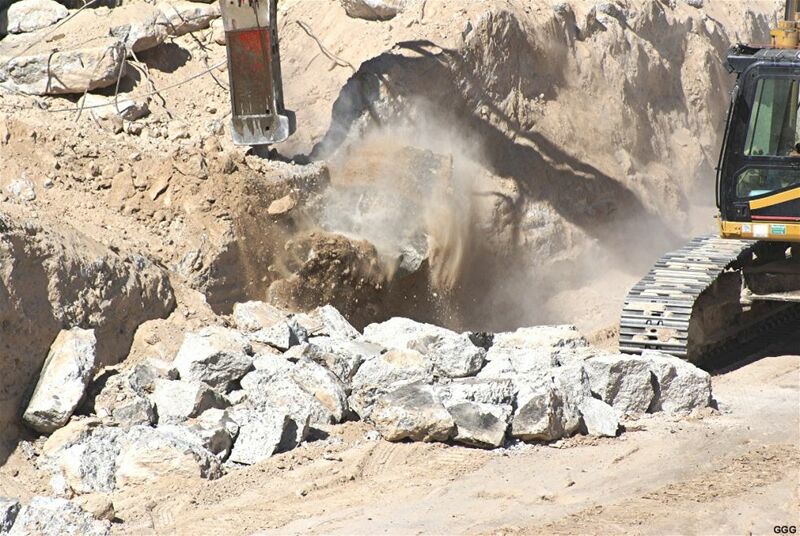 Photos 638 - 639: Ames is collecting the huge concrete blocks that, for years, protected T-1 EP from mud flows. 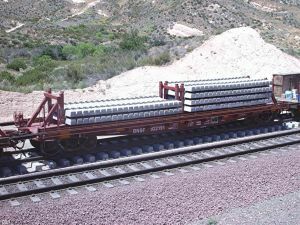 The blocks will be reused elsewhere. 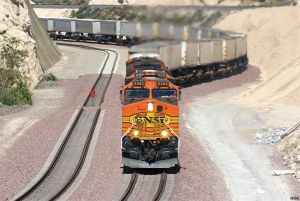 (Photos by Keith Schreiber). Photos 643 - 644: A very late Amtrak # 3 WB is shown lead by BNSF 7582. 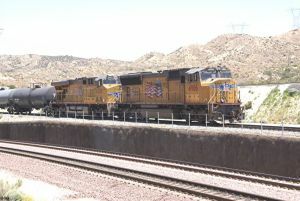 The third unit was dead-in-consist. 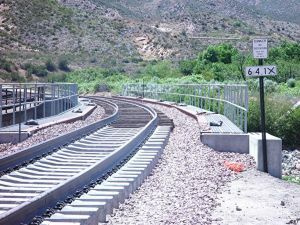 Photo 645: Also, new ballast has been added to the Out Of Service # 2 track (old # 1 track). 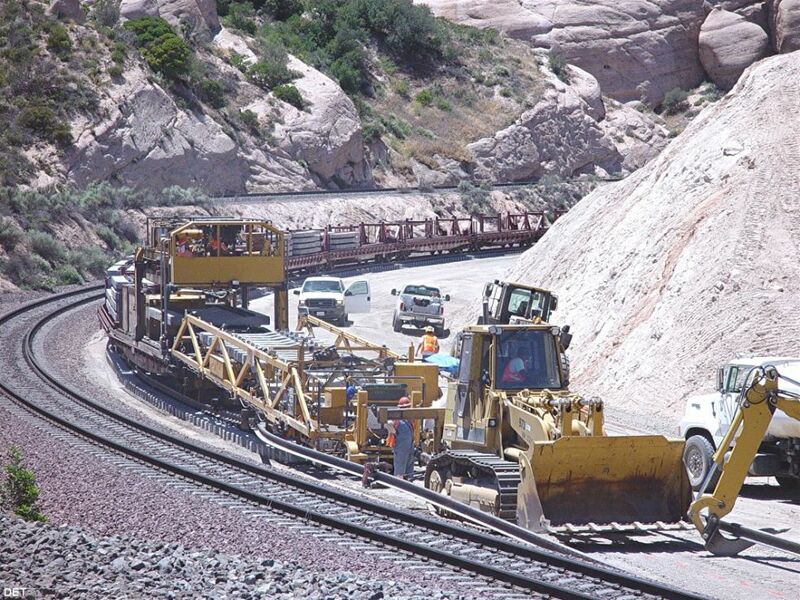 The machine (just RR EAST of T-1) is "regulating/dressing" the ballast in preparation for the return to service. 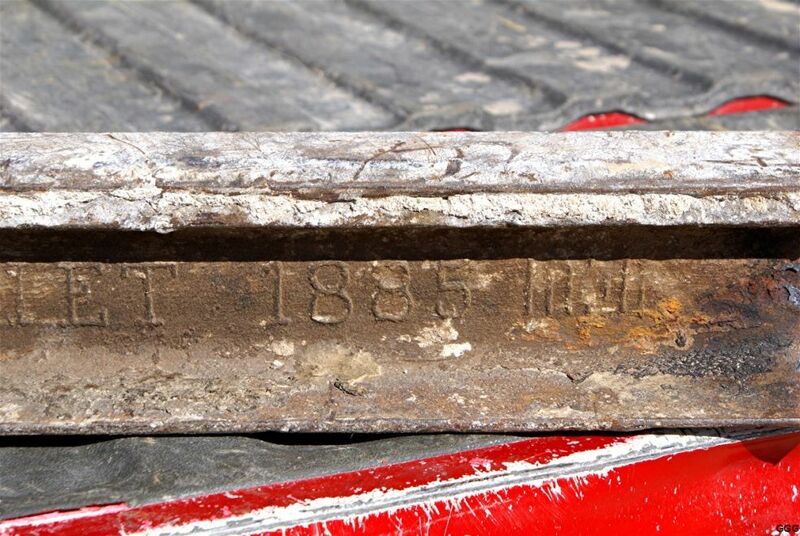 Photos 646 - 647: A while back, we sent some pictures of 1887 rail found in the floor of T-1 (see photos 593 - 594 on page 6). 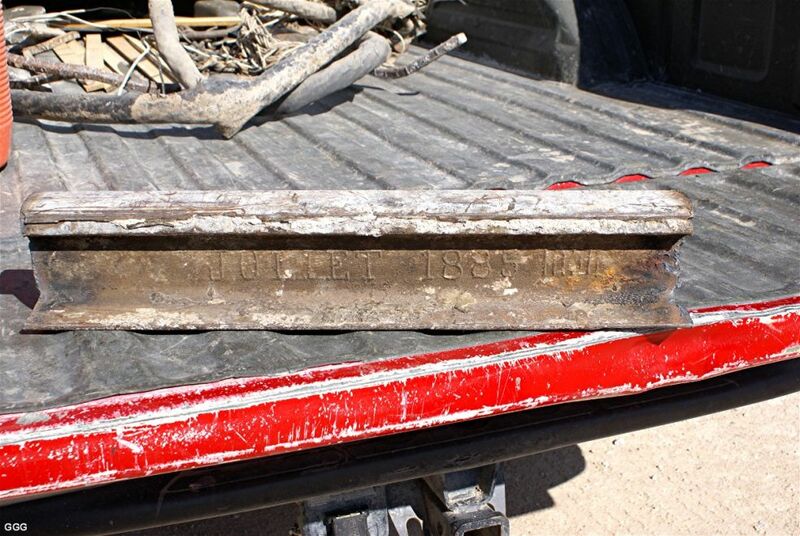 Last Wed, we were shown a piece of 1885 rail found in the same tunnel. After the "1885", please note the seven vertical bars. Those bars denote the month (July) of manufacture. As you may remember, the OLD # 1 track through the tunnels was removed before the tunnels were destroyed. We had wondered how BNSF would replace that track without the TLM (Tie Laying Machine) present - since concrete ties weigh 700+ lbs each. .Photo 656: Marc Founier photographed this ingenious device which carries 11 concrete ties. The red marks on the ground are the centerline for Track # 2. 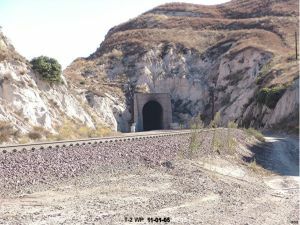 Photo 660: In 2005, Don and I thought we'd document the BNSF Cajon Sub tunnels "as they were". 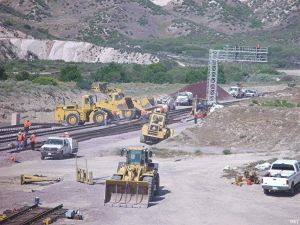 That small project grew into over 1000 pictures showing the progress of the Third Main track construction. 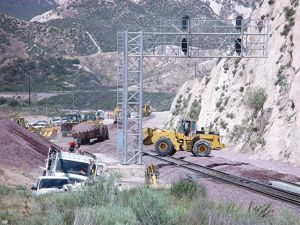 While we wanted to photograph everything involved, we were always very aware of "not getting in the way" and all of the many safety concerns. 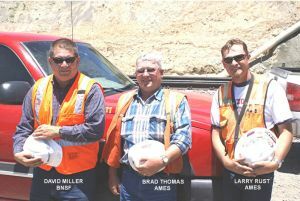 We are indebted to many people but we especially want to thank David Miller of the BNSF RailWay, Brad Thomas and Larry Rust of AMES Construction for their friendship and willingness to share their construction and railroading expertise. 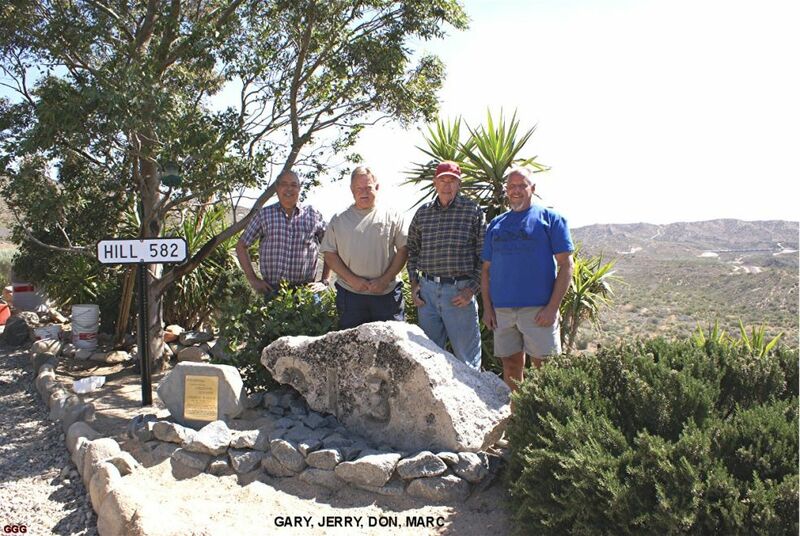 Photos 661 - 662: What a change between 1939 and 2008 ! ! 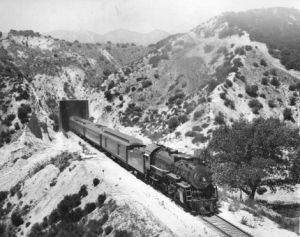 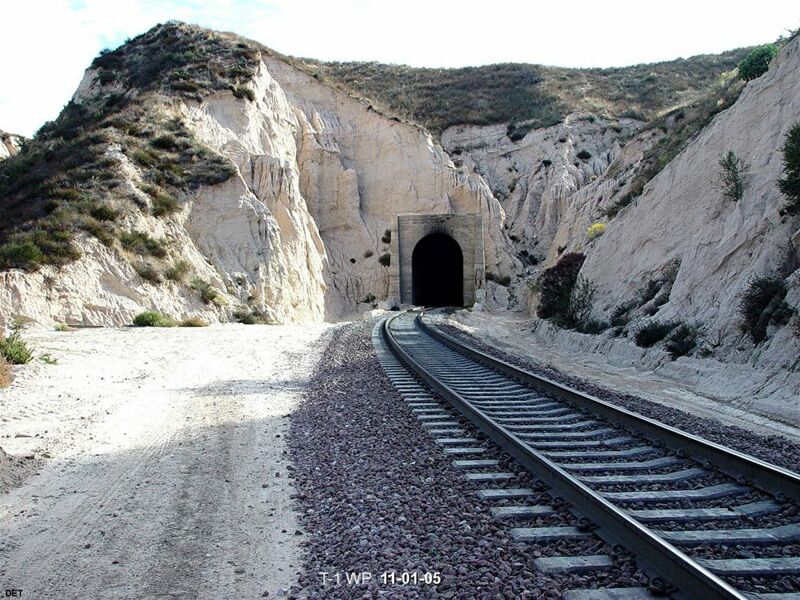 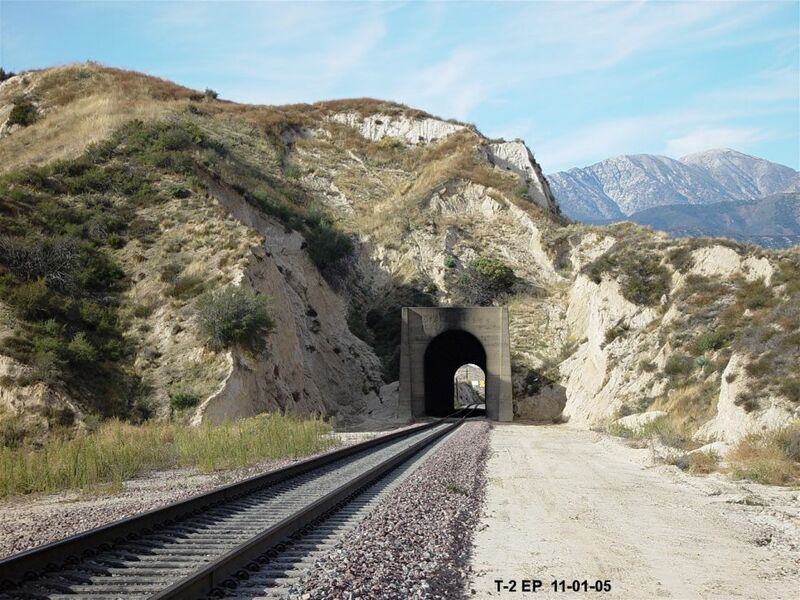 - I asked Marc Fournier to try and get to the place where Mr. Thrall took the 1939 picture of Tunnel 1 East Portal. 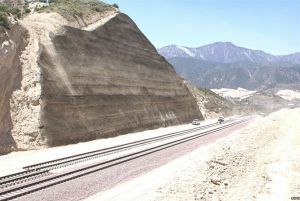 Marc has done a great job to see the dramatic changes. These 2 photos are also on our special page: Tunnel Changes. 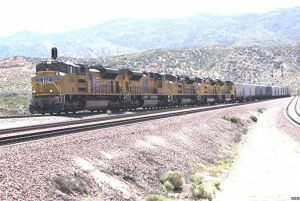 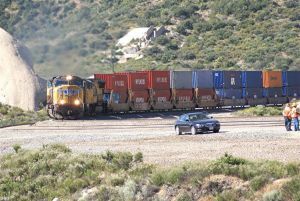 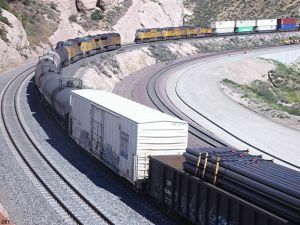 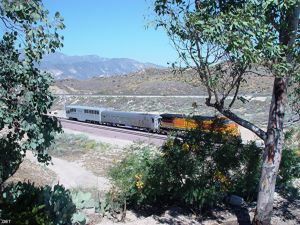 Photo 664: BNSF 7602 is WB approaching Swarthout Canyon Road. 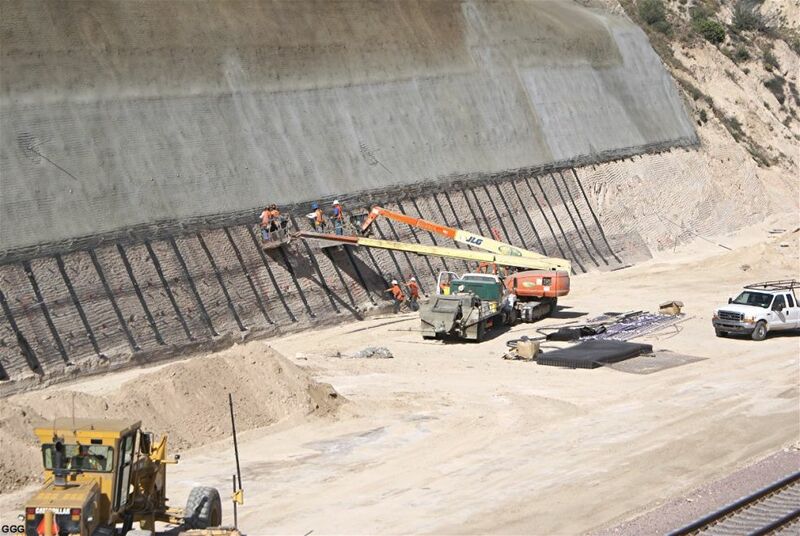 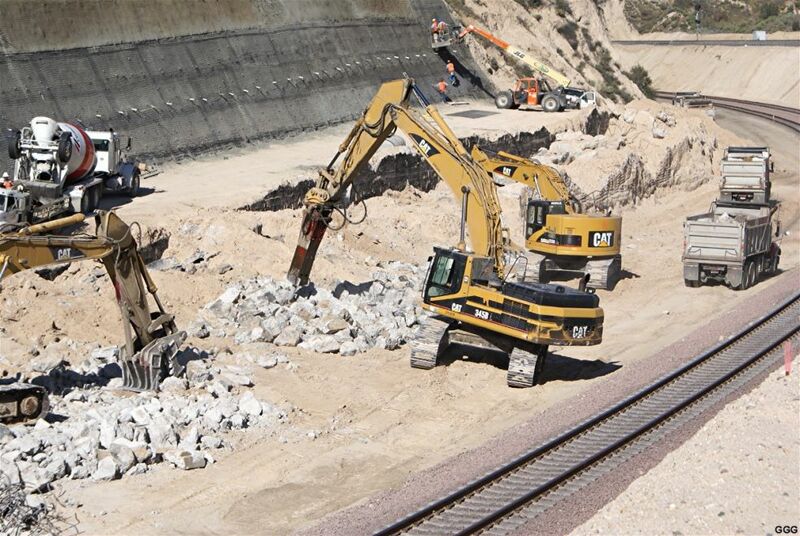 To the left, DrillTech is preparing to ShotCrete the hill face above the BNSF tracks. 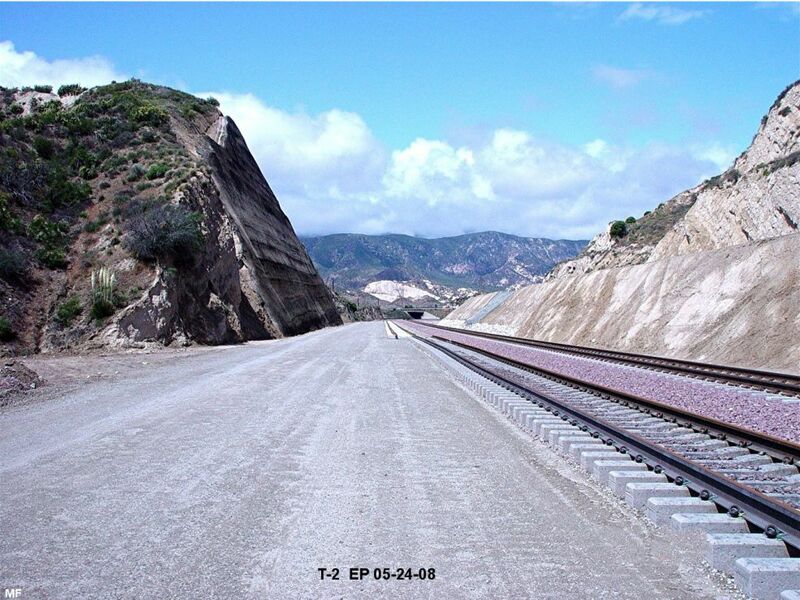 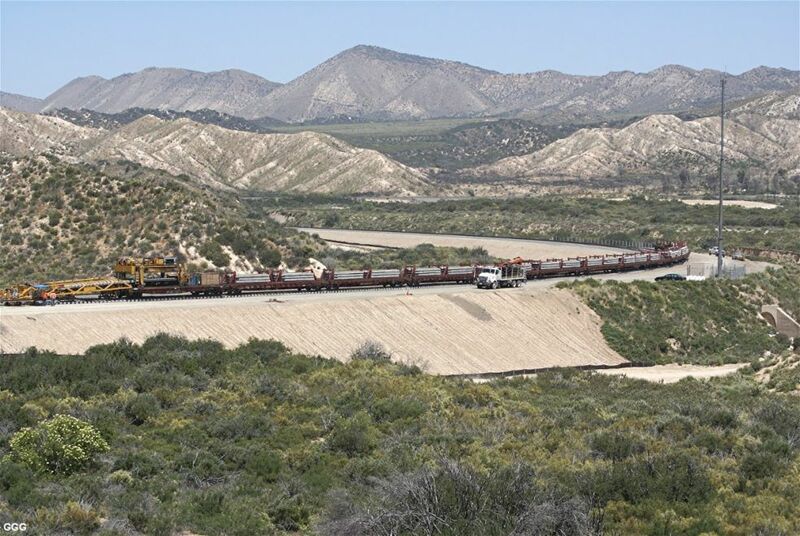 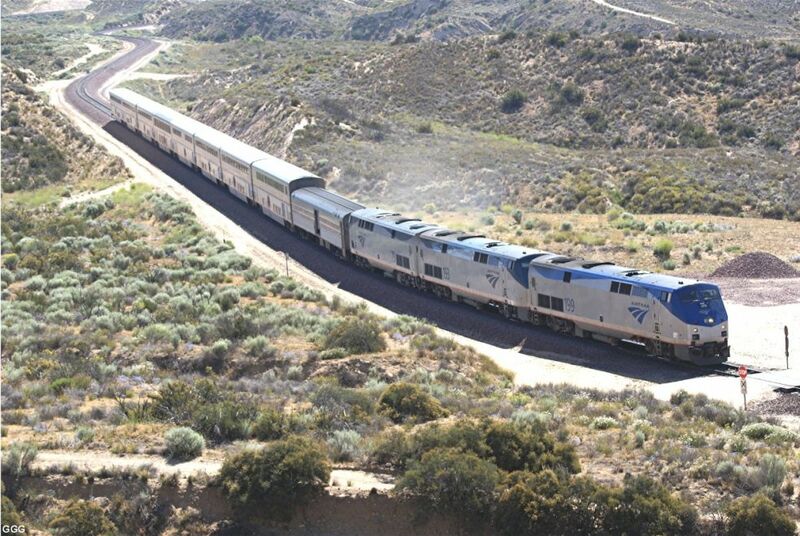 The importance of this hill is shown in the second picture photo 665.It supports the UP/SP Colton/Palmdale Cutoff. 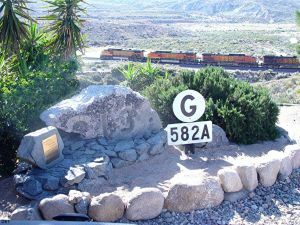 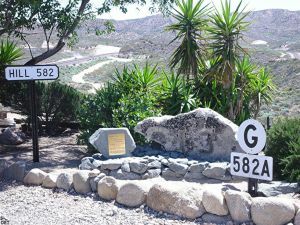 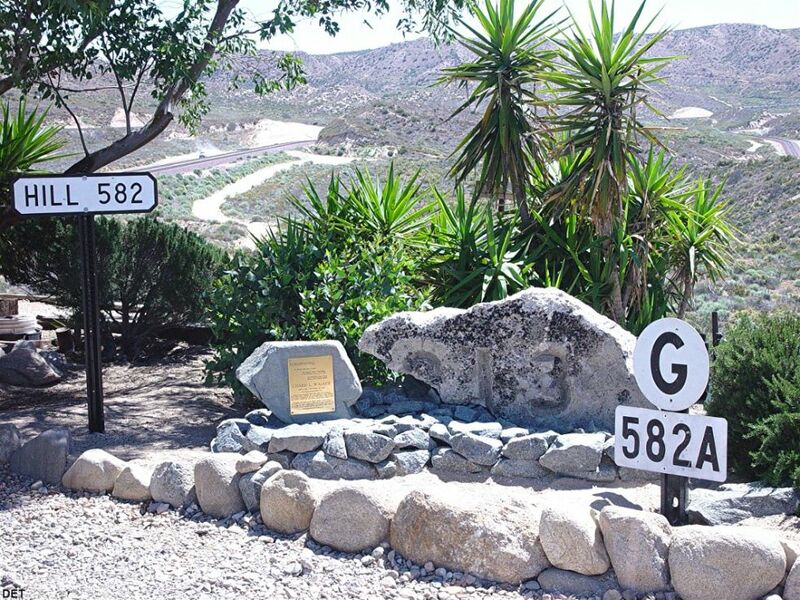 Photos 667 - 668: Thanks to our good friend, the original "582A" and "G" signs from the old Main # 1 EB signal at Hill 582 "appeared" on Hill 582. Don and Marc erected the signs this week -- welded and in concrete. 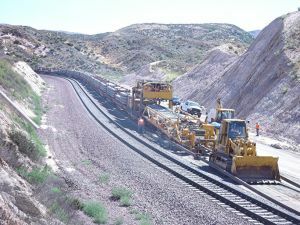 BNSF has started laying ties and track WB starting at CP Walker (MP 60.2X). 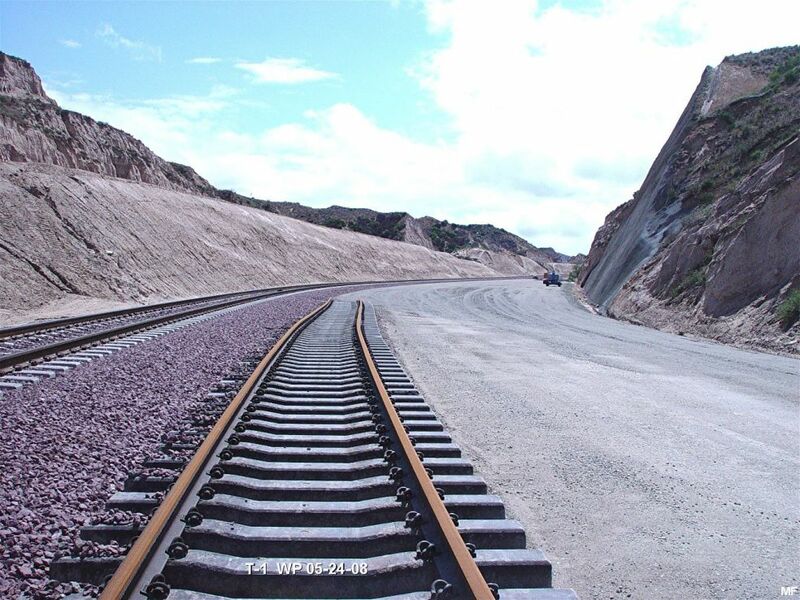 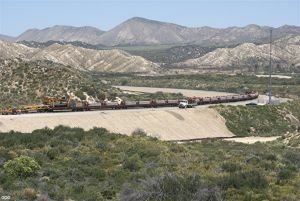 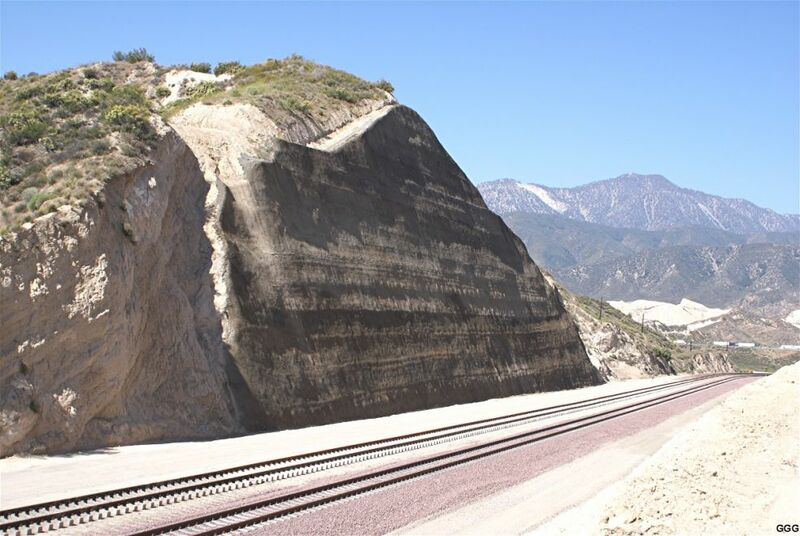 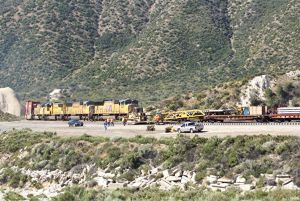 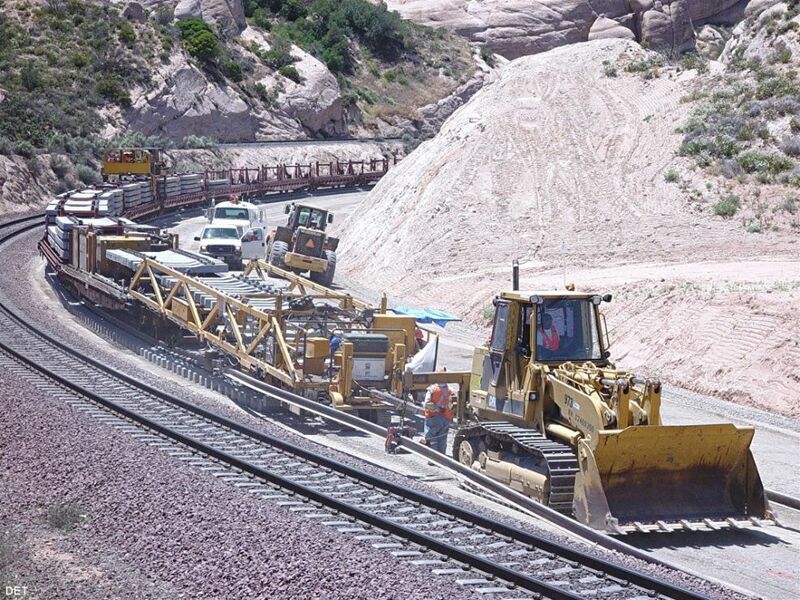 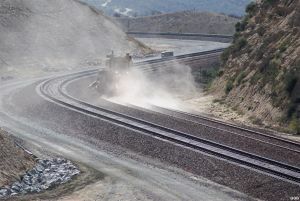 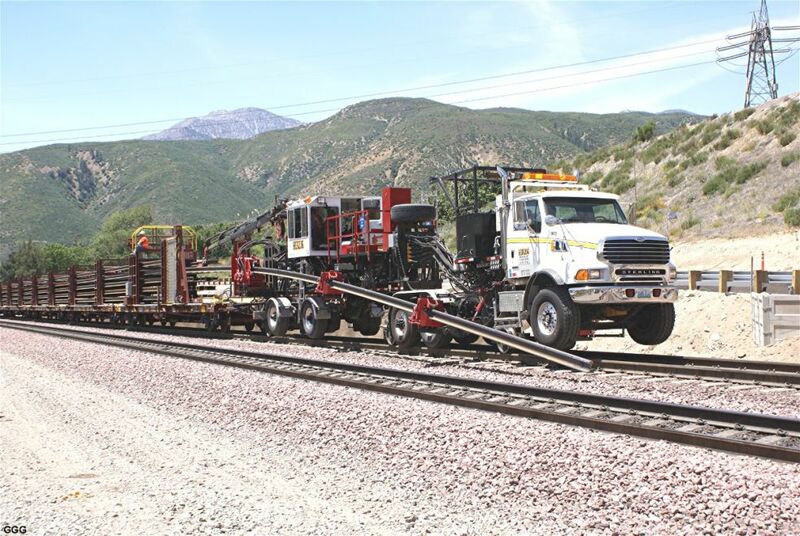 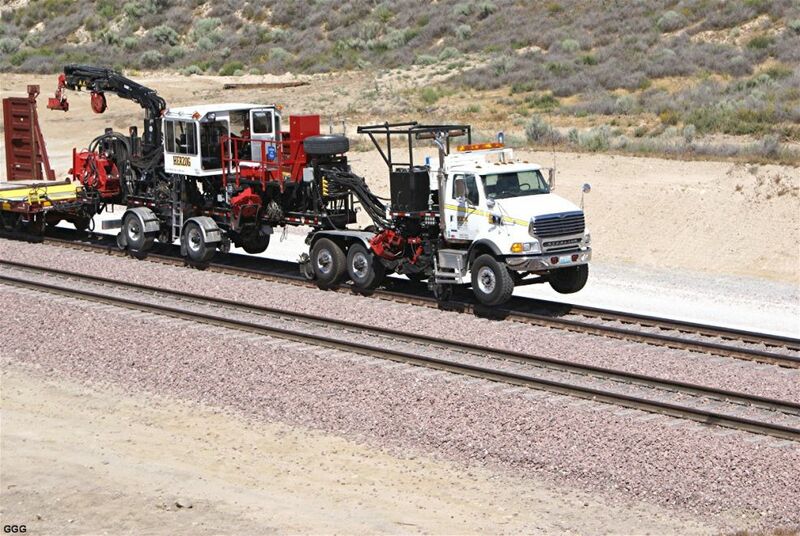 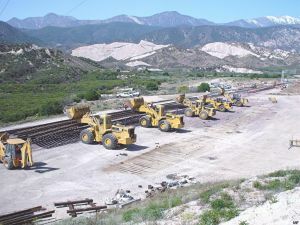 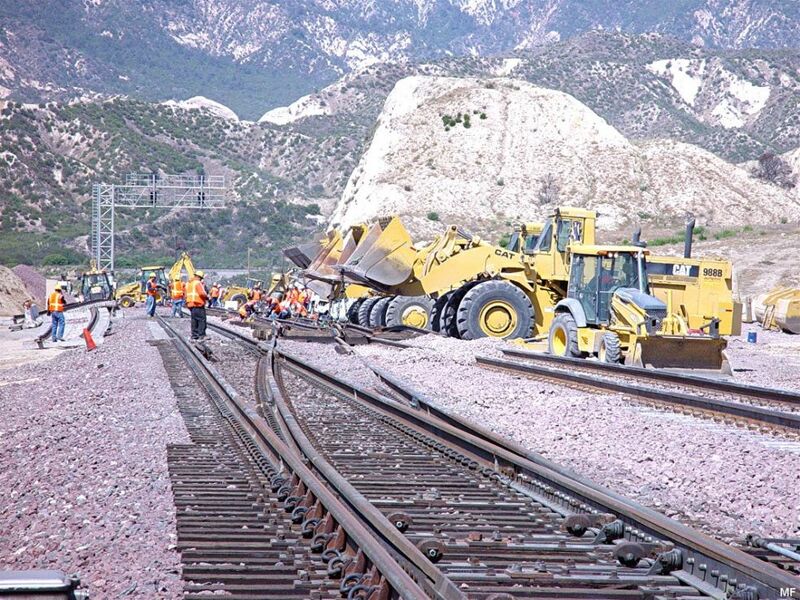 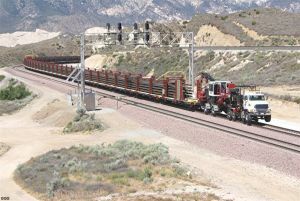 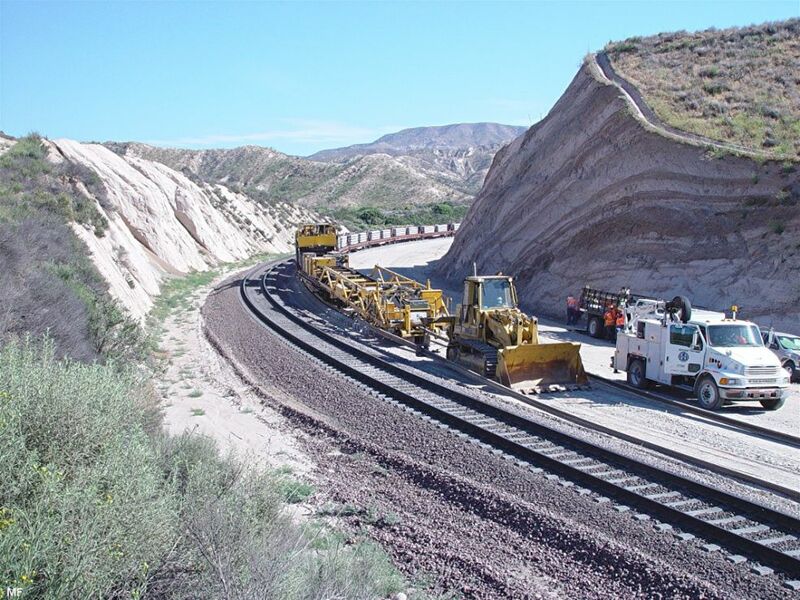 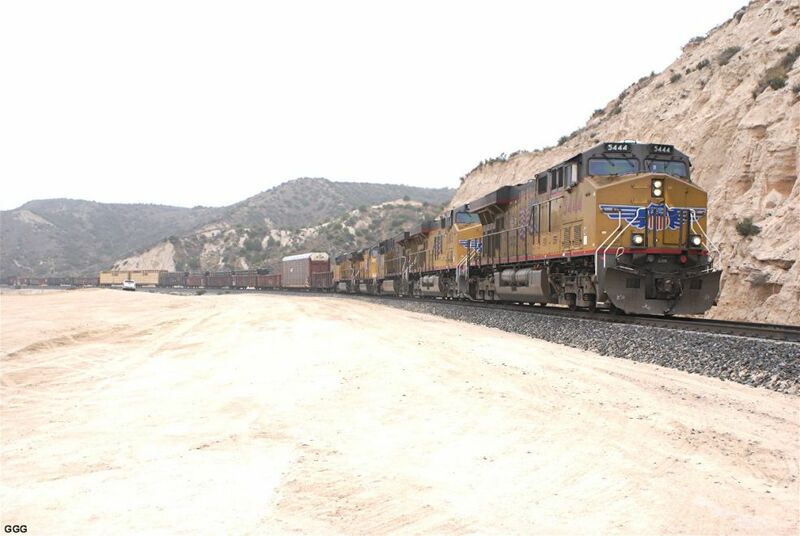 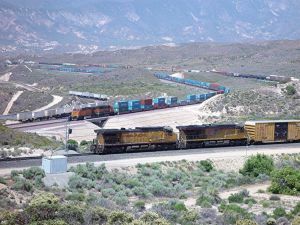 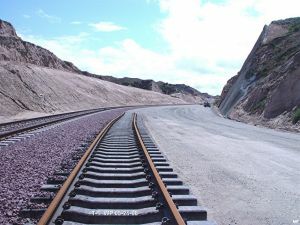 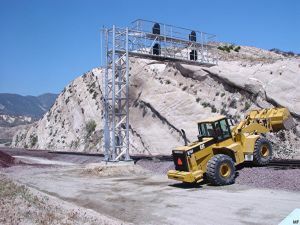 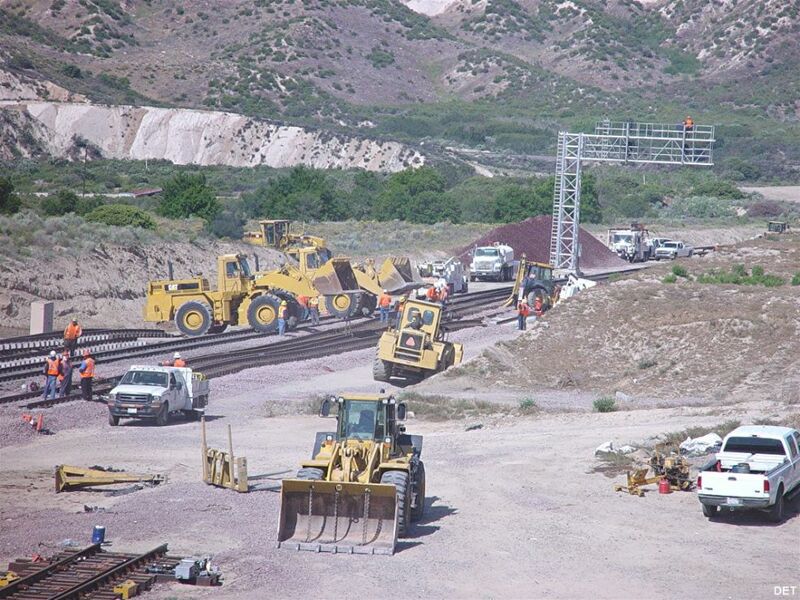 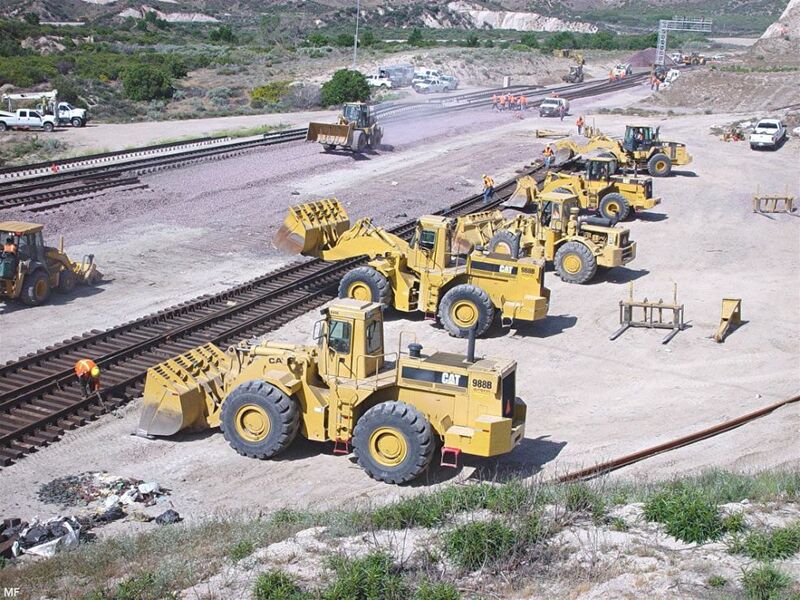 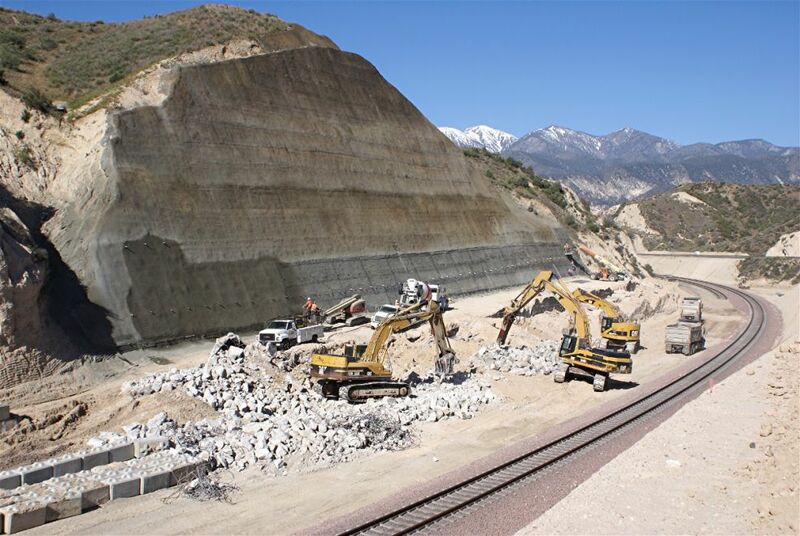 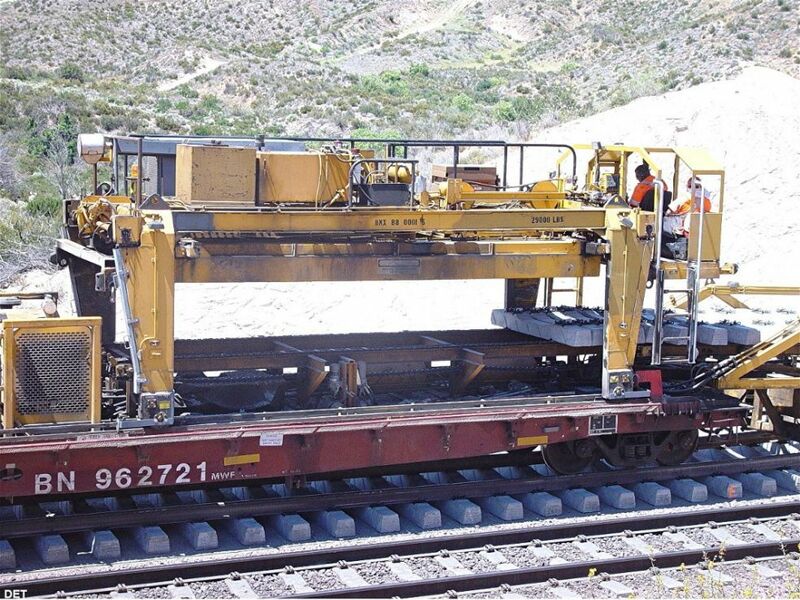 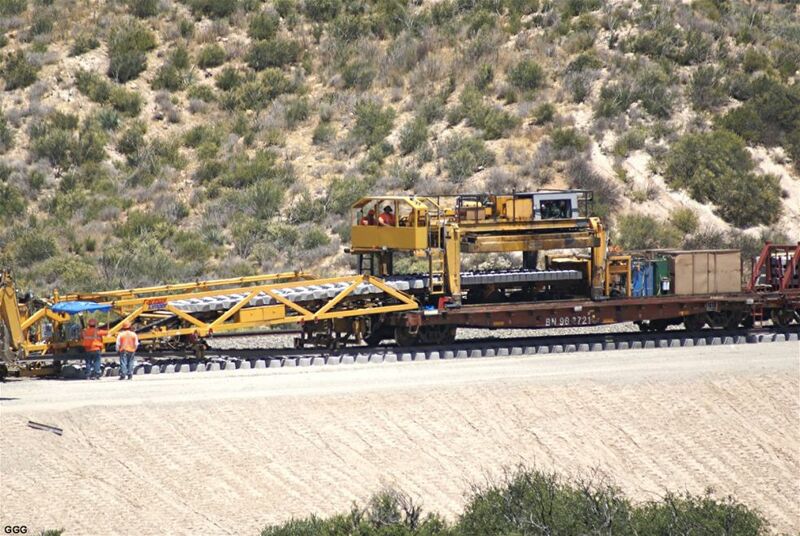 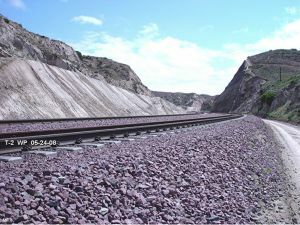 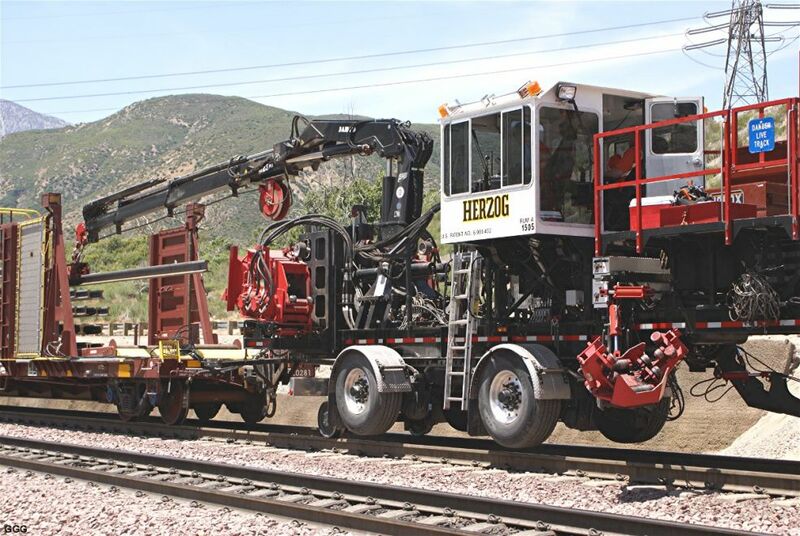 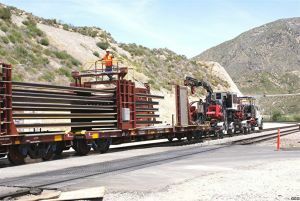 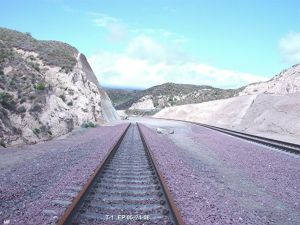 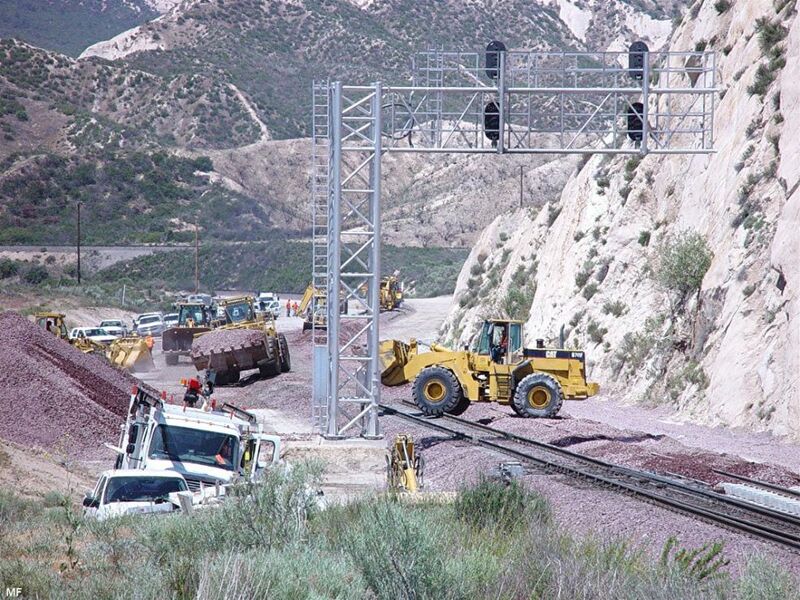 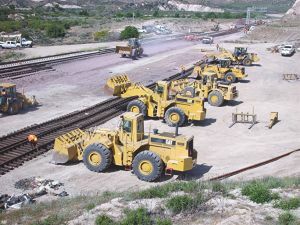 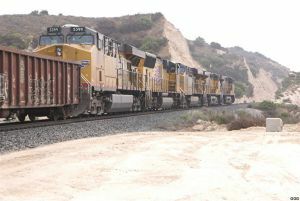 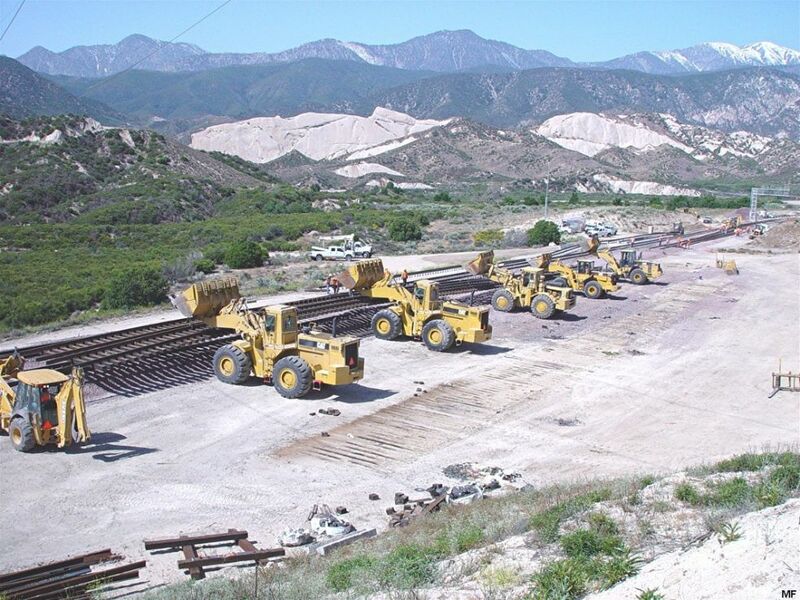 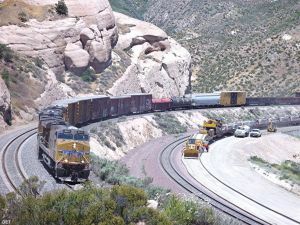 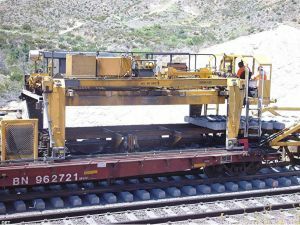 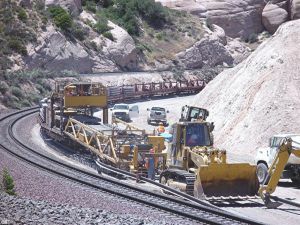 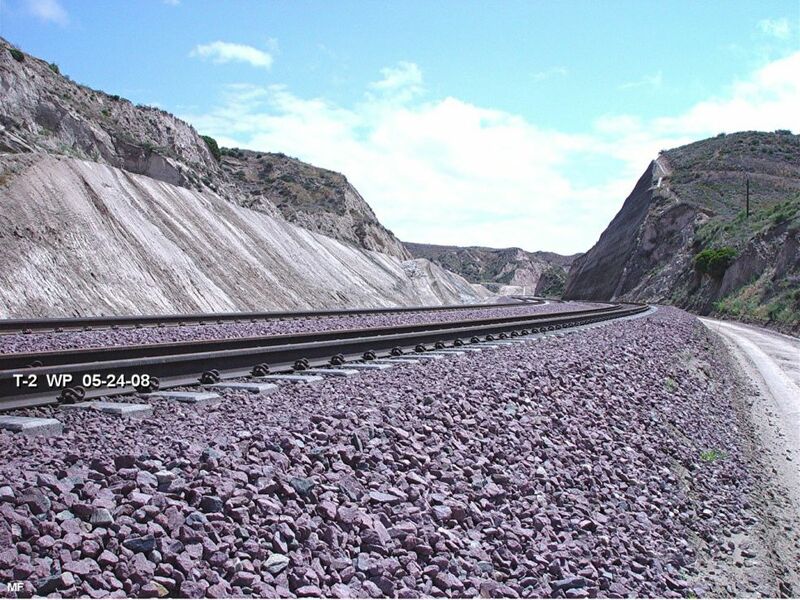 The Tie/Track laying machine, as of 6/11/08, was working West near the Mormon Rocks. 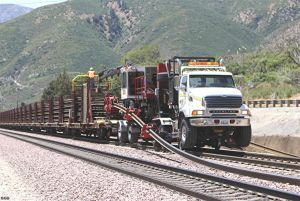 Photo 669: Marc sends one of the TLM dropping ties and pulling in the rails near MP 61. 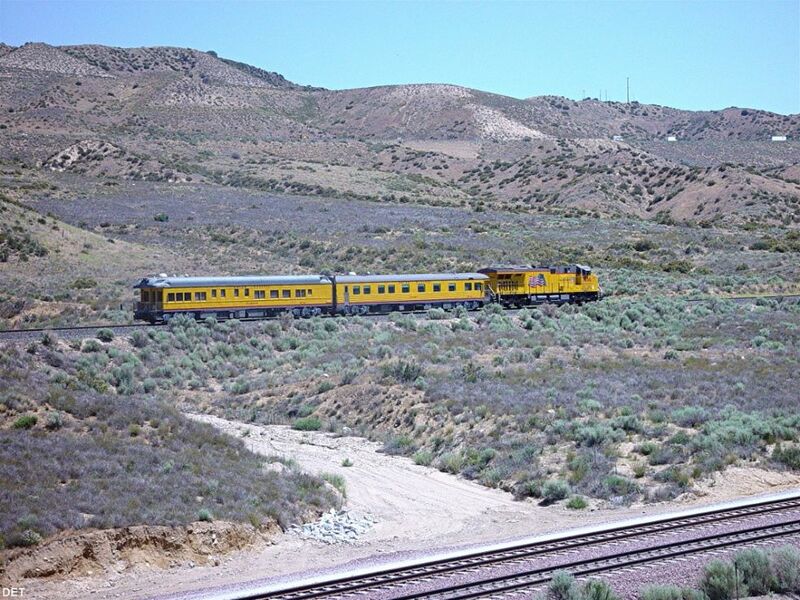 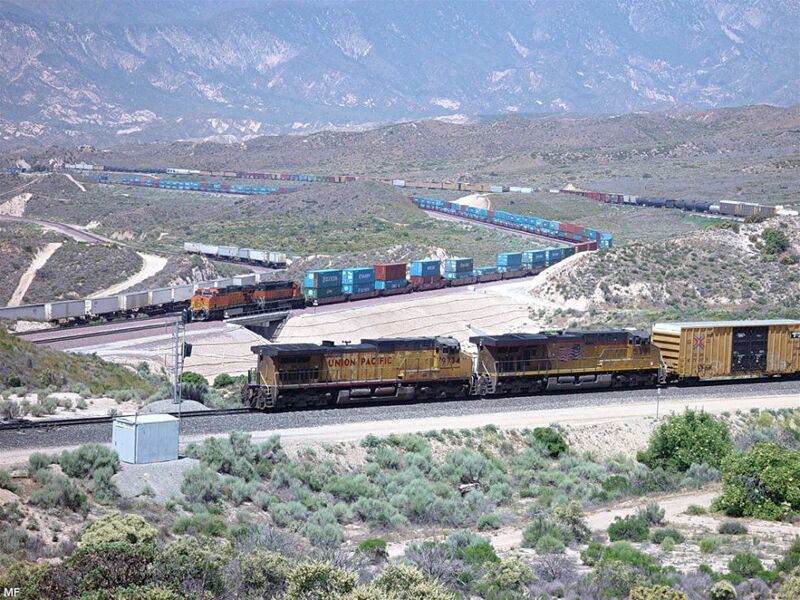 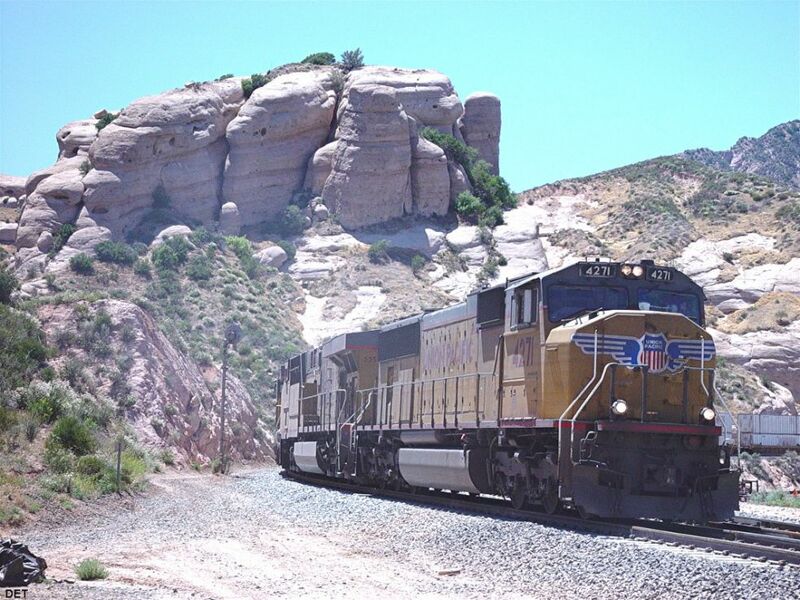 Photos 670 - 671: GGG sends two of the TLM just RR East of Mormon Rocks heading toward the Pine Lodge Bridge/Hwy 138. 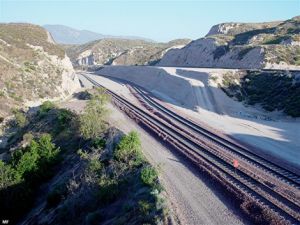 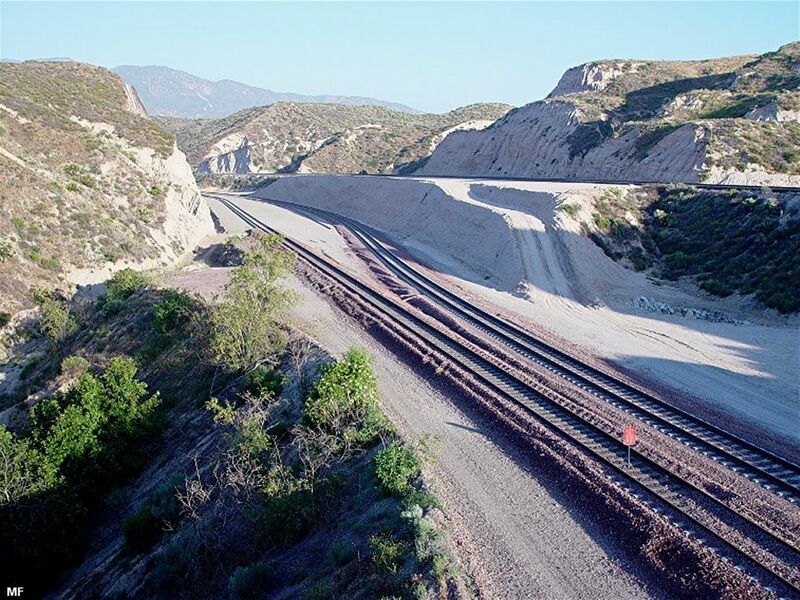 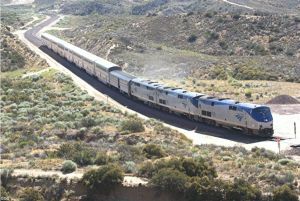 Photo 672: Marc Fournier sends this beauty of all in-service tracks being used in Cajon as seen from above the MP 57.2 bridge: On the UP/SP, the helpers are SB to Colton with a mixed train. 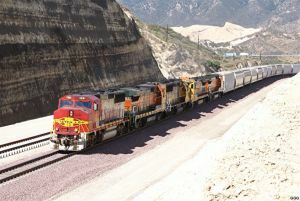 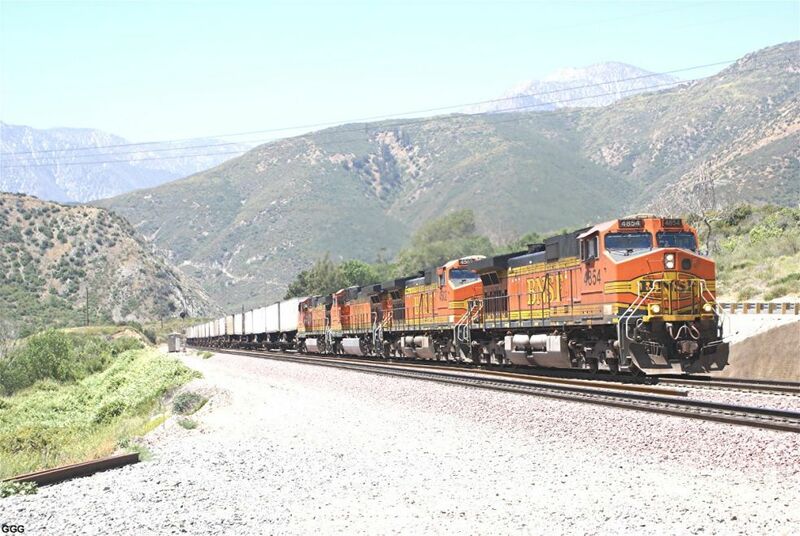 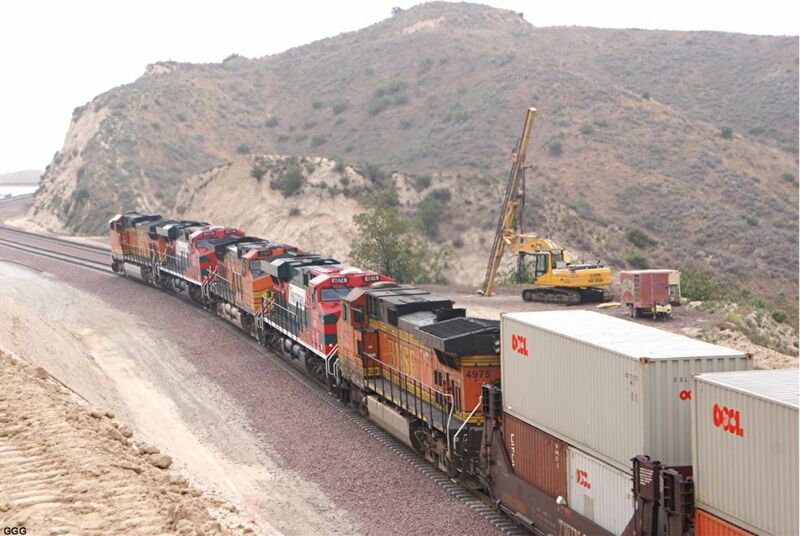 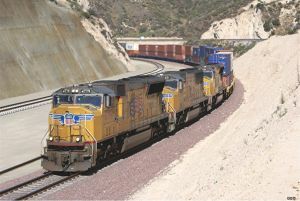 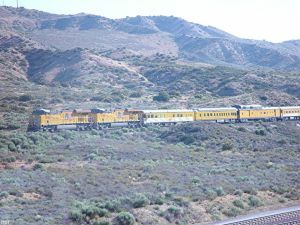 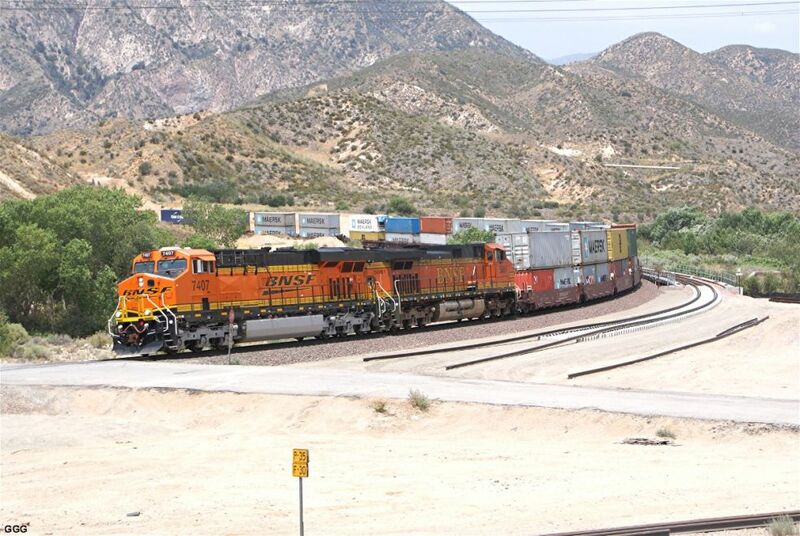 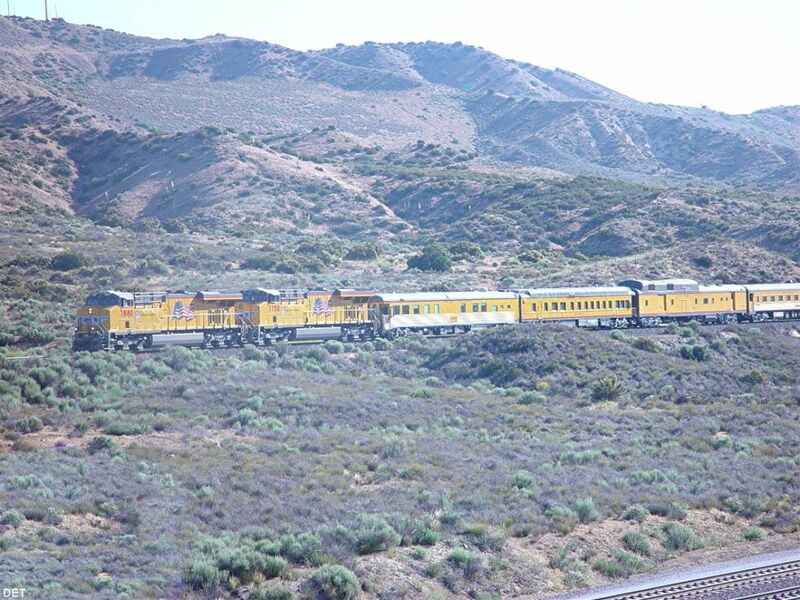 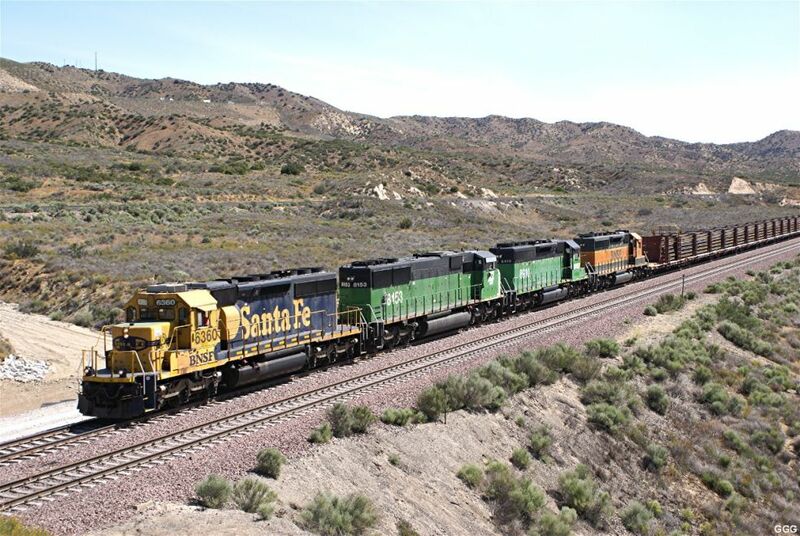 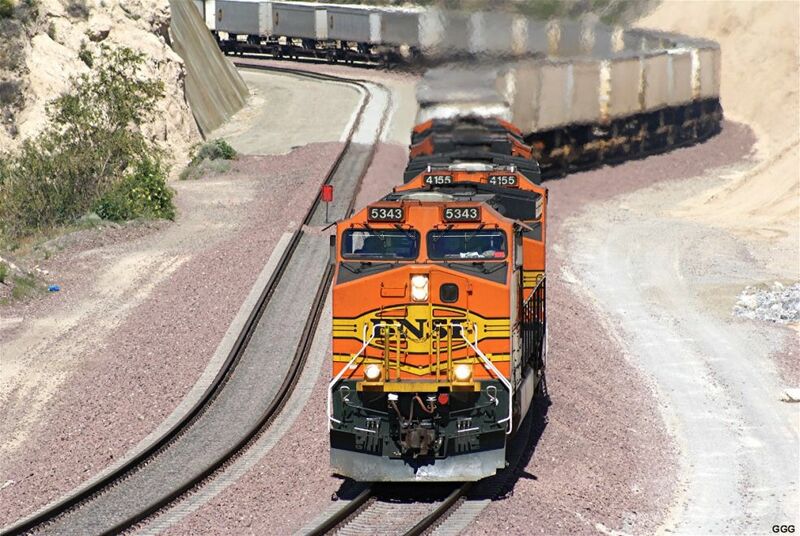 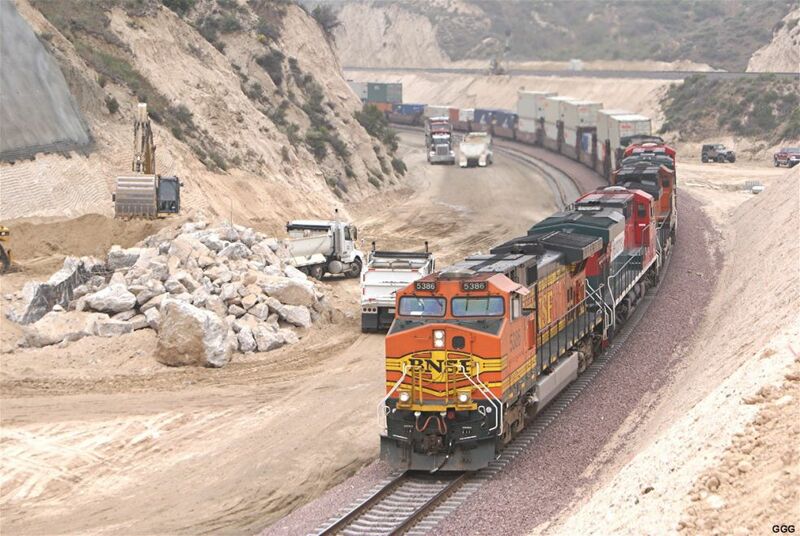 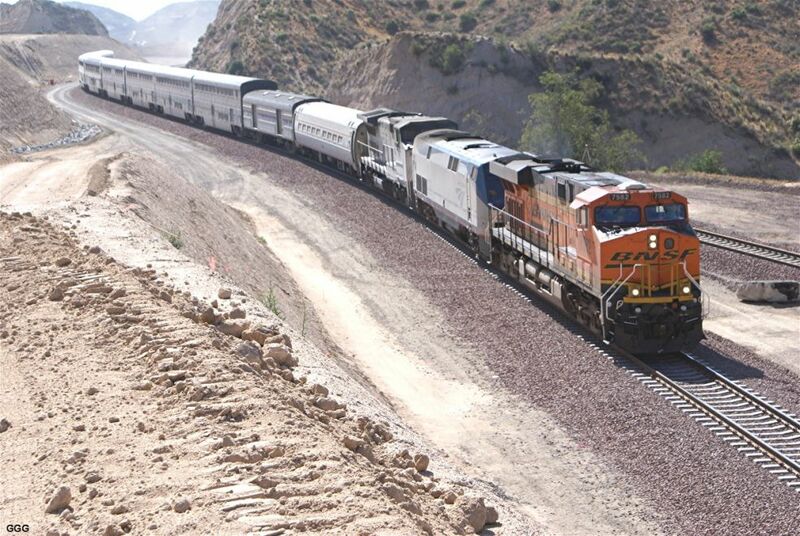 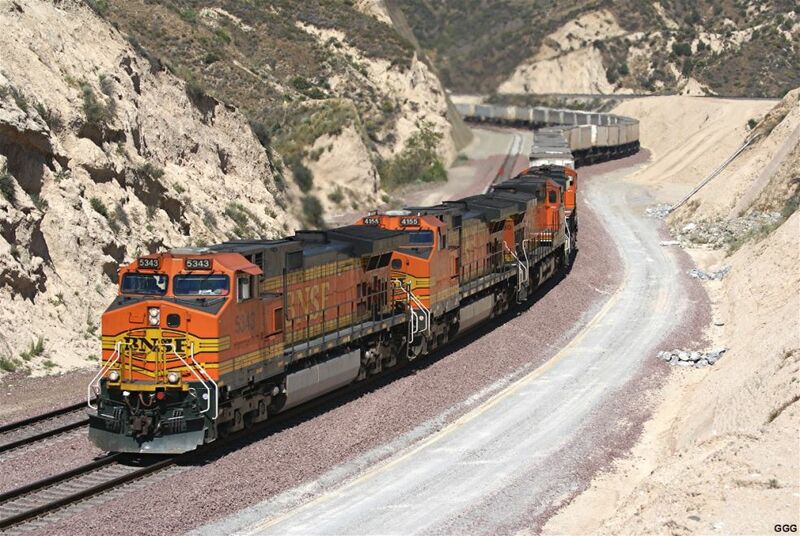 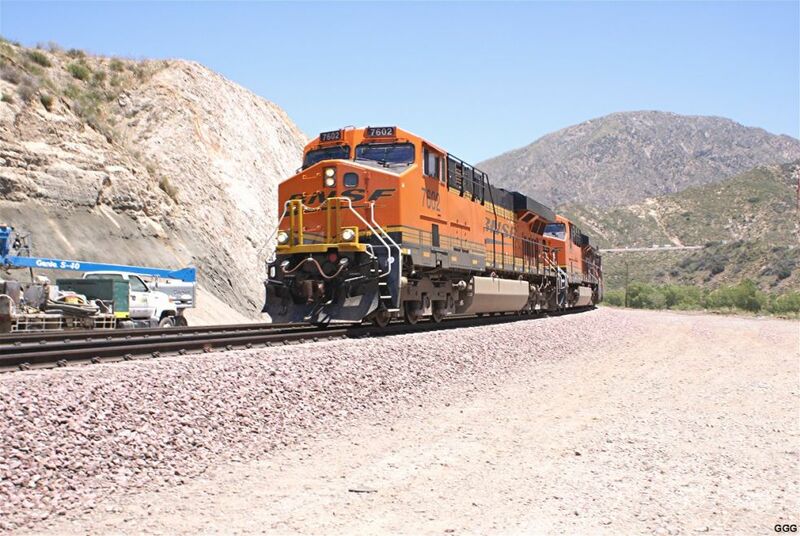 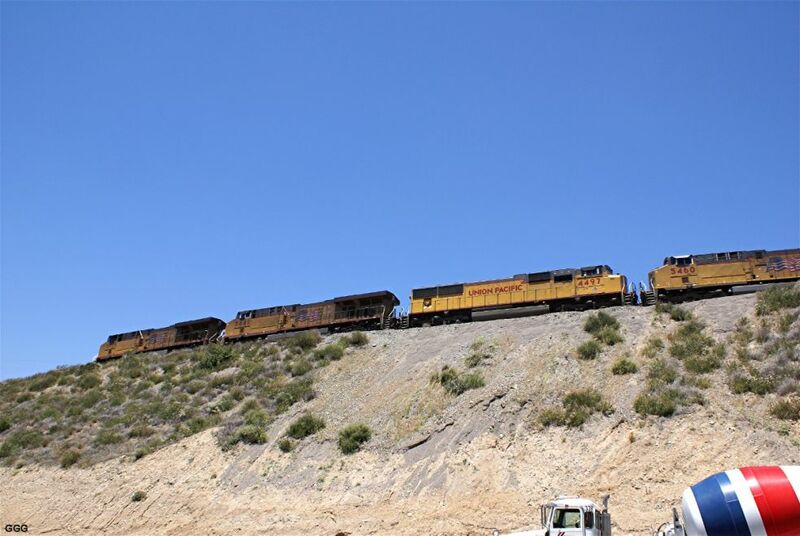 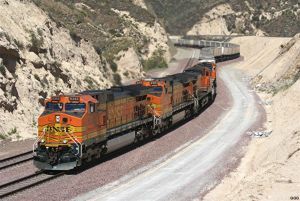 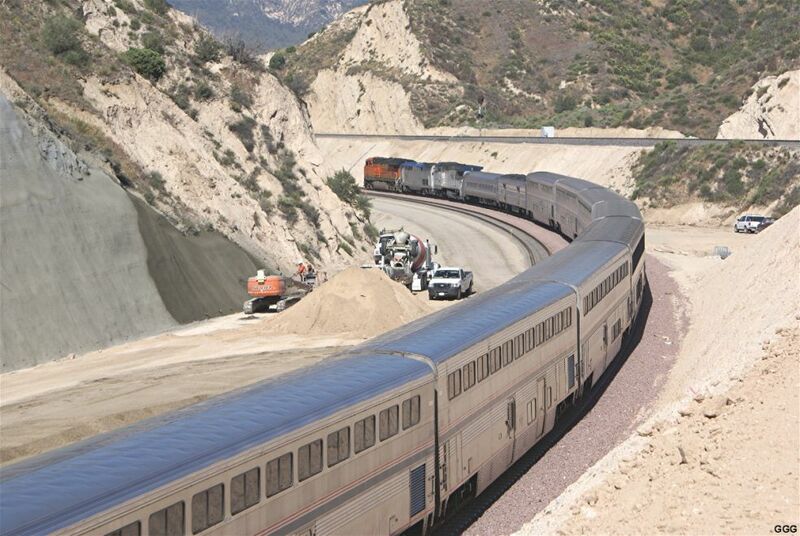 On BNSF # 1, the helpers are WB to San Bernardino with a double stack train. 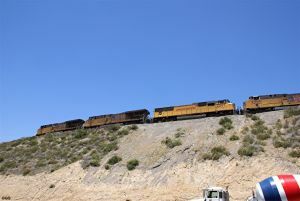 The barely visible BNSF # 2 is out-of-service. 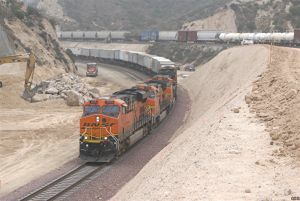 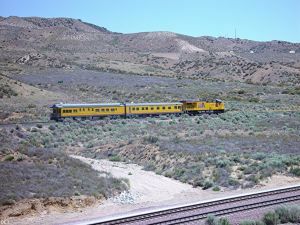 On BNSF # 3, the TOFC train is EB to Barstow. 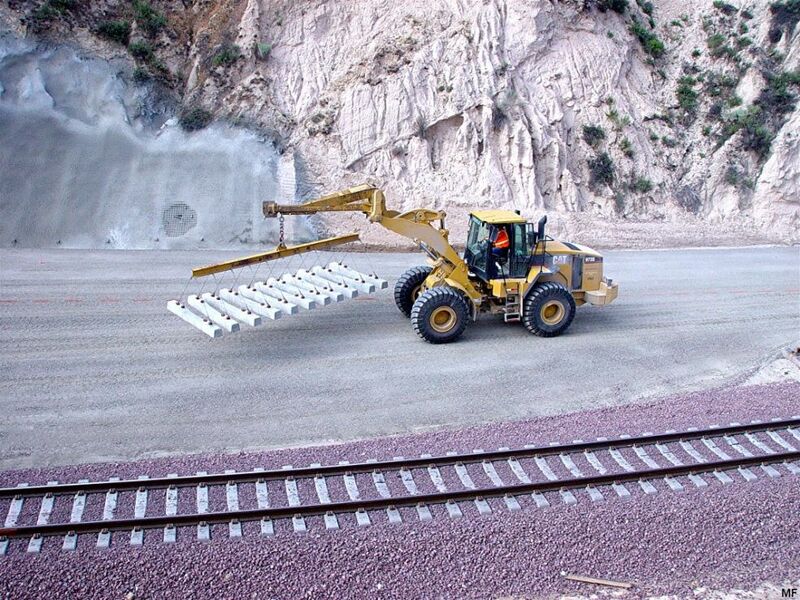 Photos 673 - 678: Even these pictures do not show the actual progress of the 3MT construction, it still gives us a nice impression about the daily activities. 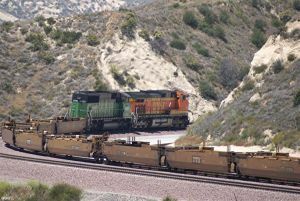 Photo 677: From right to left: BNSF Main # 3, Main # 2, Main # 1, Silverwood Connector w/UP train. Photo 678: From front to rear: BNSF Main # 2, Main # 1, Silverwood Connector w/UP helpers, UP Main (Colton/Palmdale cutoff). 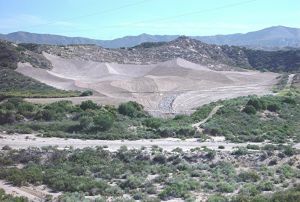 Photo 679: Just to remember, the old borrow pit near Stein's Hill, was used to gain dirt for the construction of Interstate 15. Ames refilled the pit with dirt from the tunnels and graded the area to near original contours. 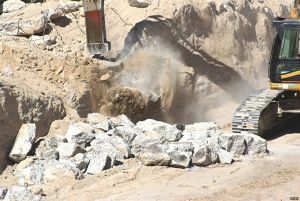 The area is "walled off" with rubble and K-Rails to keep the off-road folks away. See also photo 433 on page 5. Photo 680: UP 4947 approaches the TLM at Mormon Rocks. 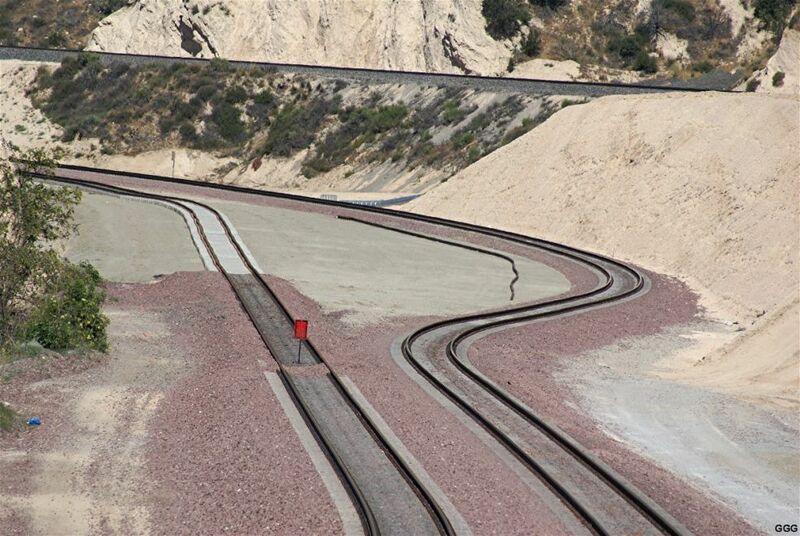 An interesting view because of long lens illusion. 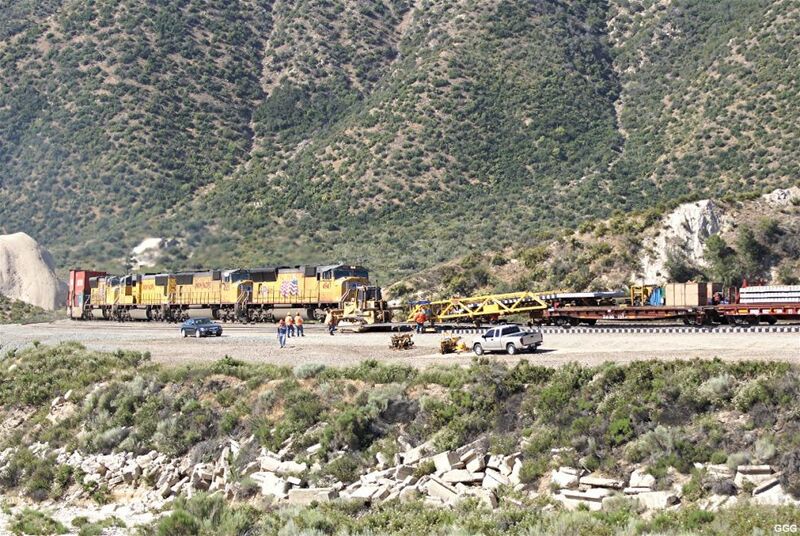 Photo 681: UP 4947 on # 1 while the TLM lays the new track (Main # 2 in this area). 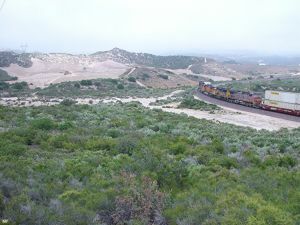 Both photos were taken from Stein's Hill. 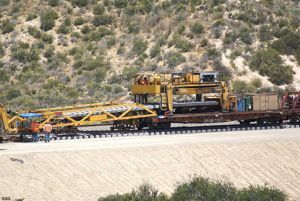 Photos 686 - 692: Don sends a great series of the TLM (Tie Laying Machine) in Sullivan's Curve. 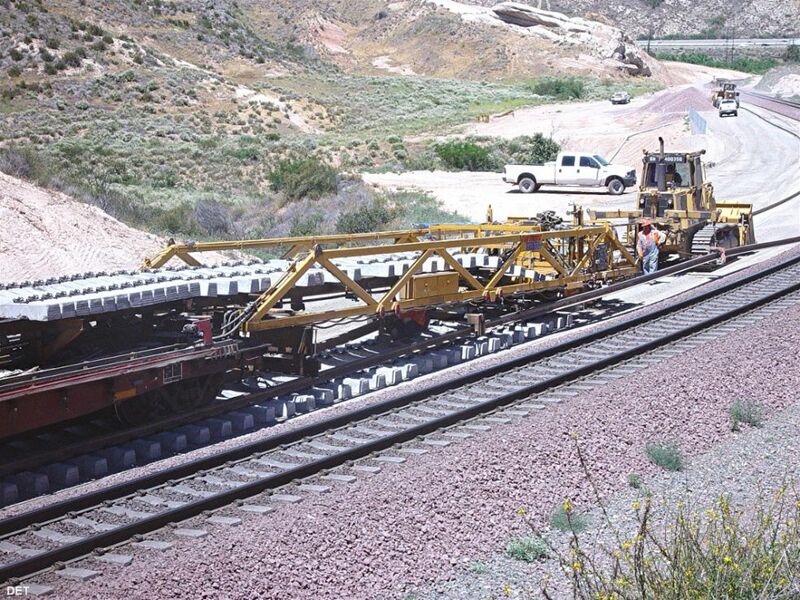 FYI, the concrete ties weigh 800 pounds each and are set on 2 foot centers. The entire 16 mile project will require approximately 42,000 concrete ties. 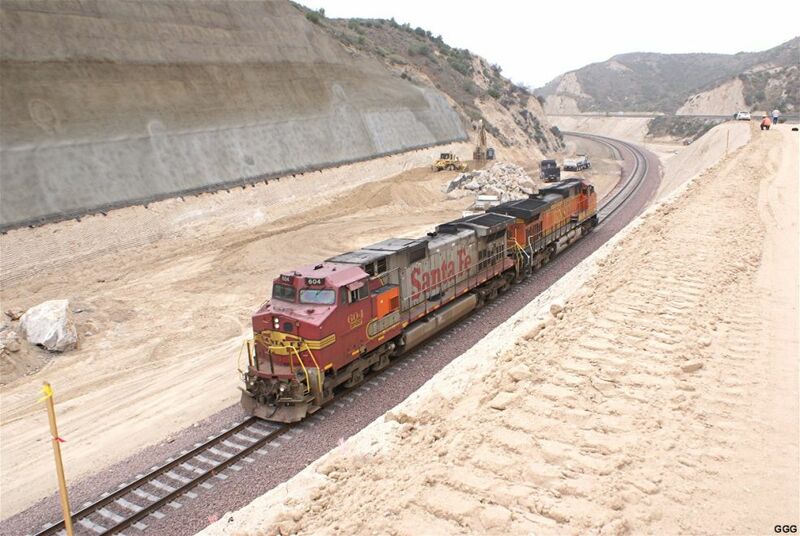 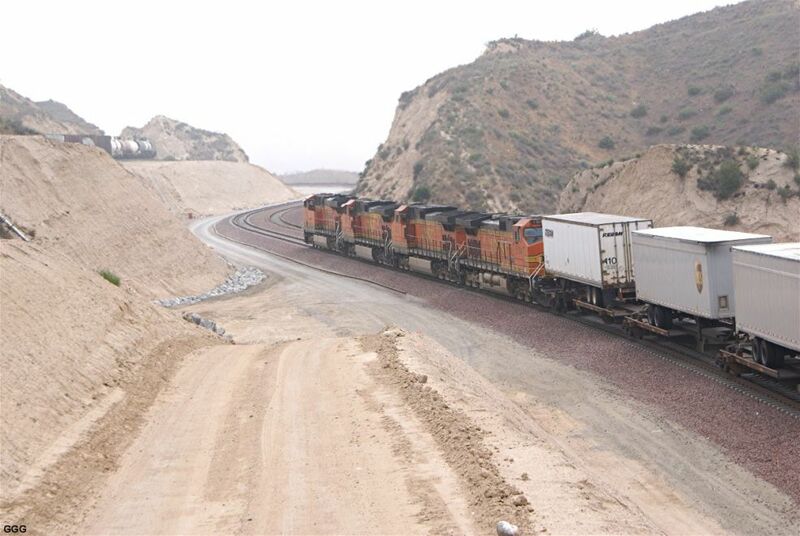 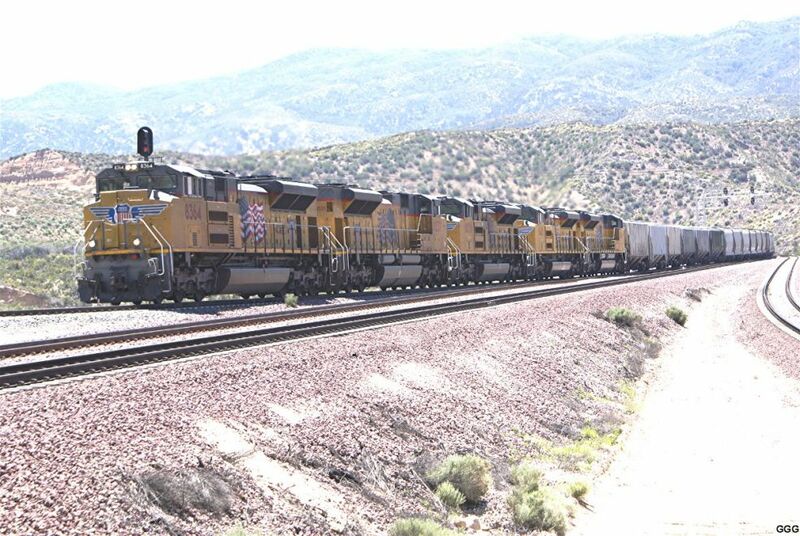 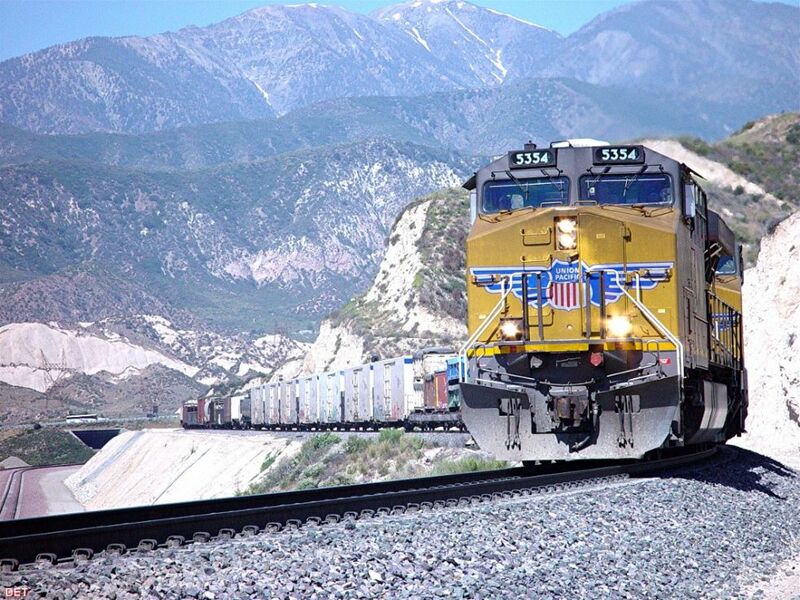 We were also told that the project will require 3/4 US ton of ballast per 12 inches of rail or 63,000+ tons. I hope my calculations are close!